Welcome to The Springerle Baker’s on-line catalog for Santas. This is our Limited Edition Santa mold from 2014. 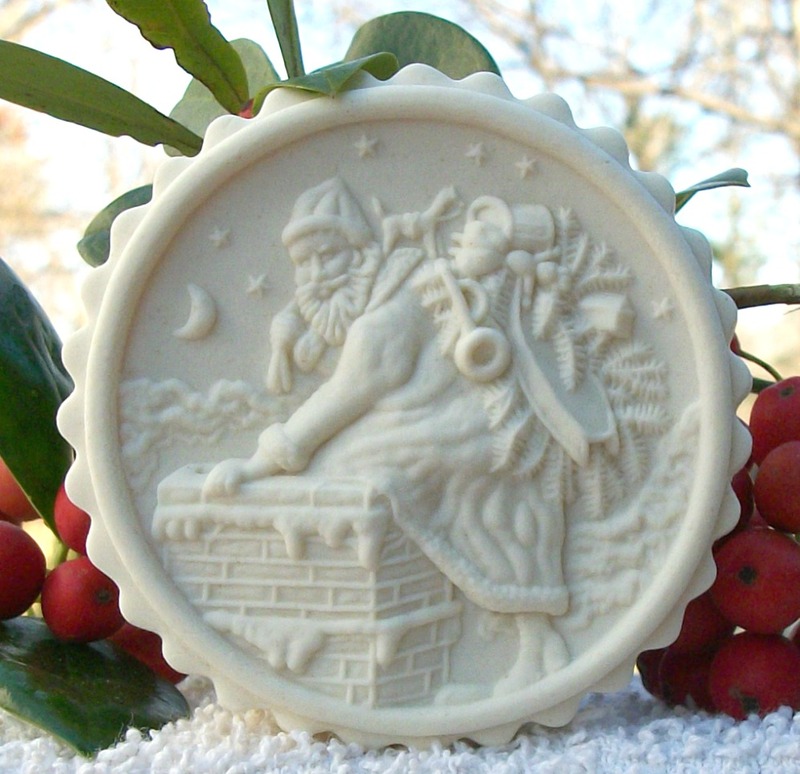 This mold measures about 2 5/8” in diameter and depicts Santa going down a chimney. You can see the moon and stars filling the night sky along with clouds. In Santa’s sack you can see a sled, horn, doll, drum, a horse, and a small fir tree. The brick work and snow on the chimney are very visible as well as Santa’s features. This mold produces a very dimensional image that is sure to impress. We made the border a simple ring but by being so, it adds a lot to the overall appeal of the image. This mold is limited to 300 copies and sells for $38.96. Cookie made with mold #1741. 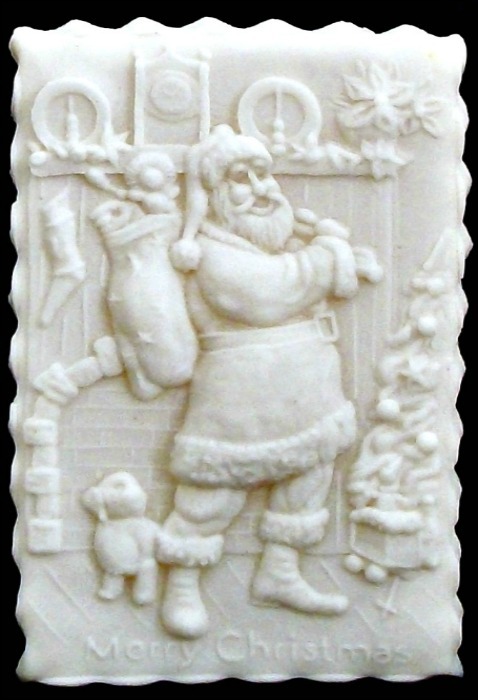 #1708 2013 TSB Santa Mold – $35.75. 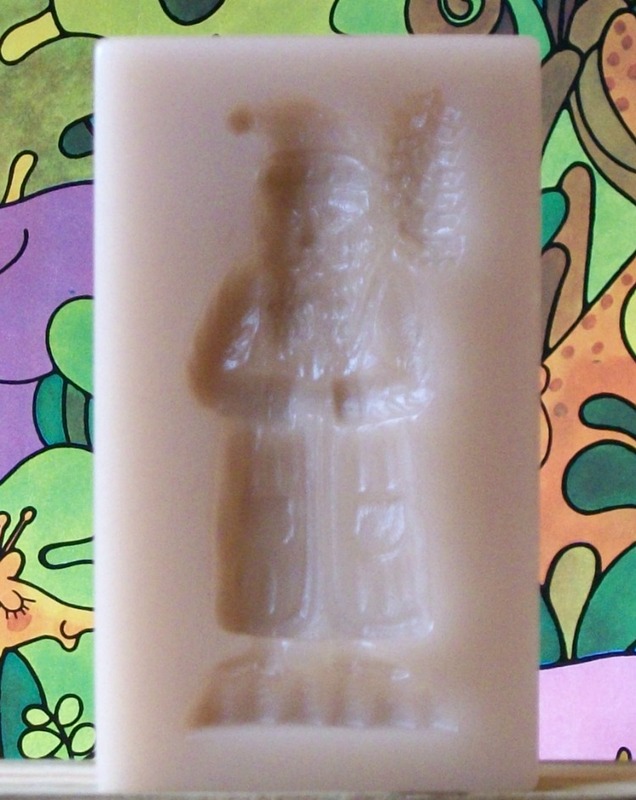 This is our Limited Edition Santa mold from 2013. 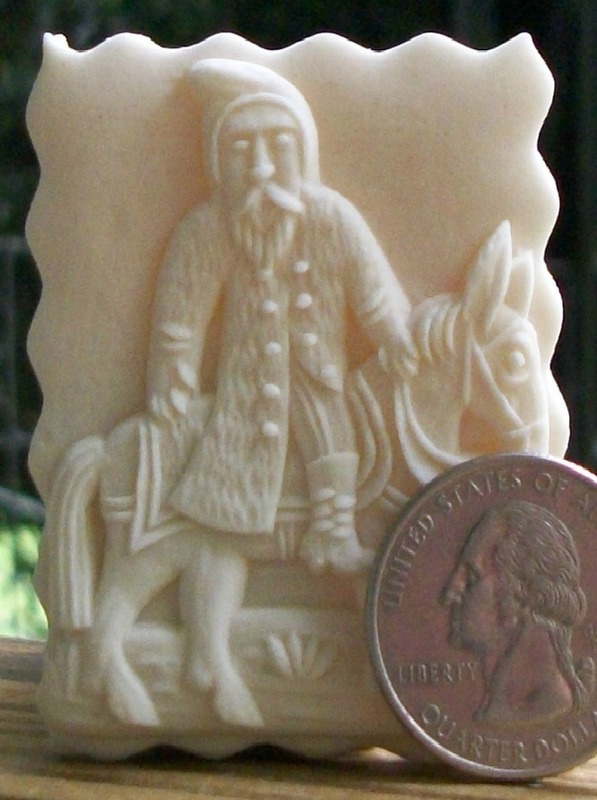 This mold measures about 3” x 1 7/8” and depicts Santa painting a rocking horse. Great depth and fine details. This is a beautiful design that I quickly became fond of. We had it designed with the close framed border which I feel gives the image a certain “warmth” and charm. You will be pleased with the results the mold can deliver! This mold is limited to 300 copies and sells for $35.75. Cookie made with mold #1708. 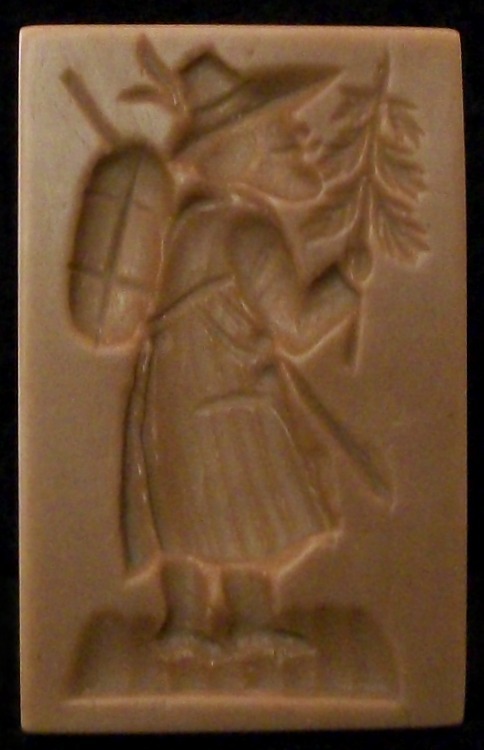 #1724 St. Nicholas Mold – $37.52. 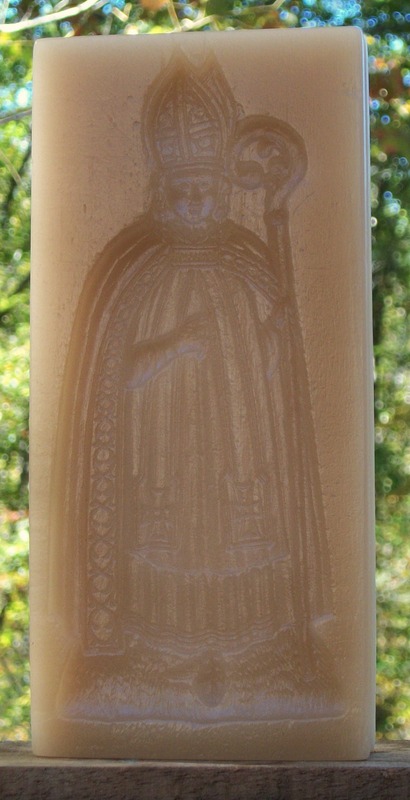 This mold featuring St. Nicholas measures about 4 3/16″ x 3 5/16” and produces a cookie that measure about 3 1/8″ x 2 5/16″. 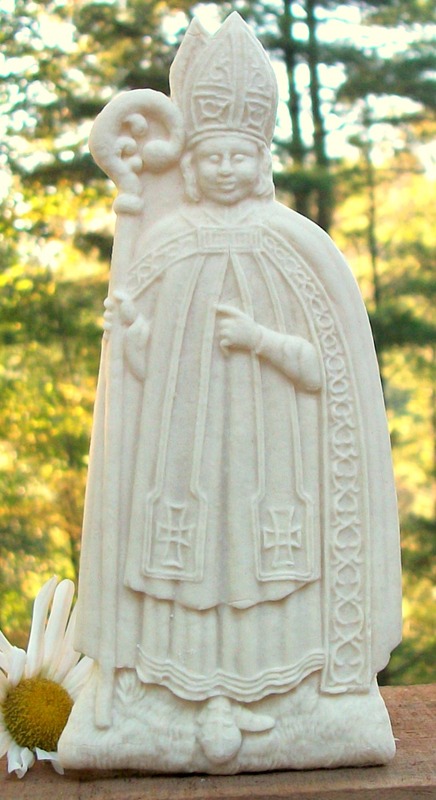 St. Nicholas is pictured standing in an archway with his staff and holding a book. The archway and side details are beautifully executed. This mold will deliver a cookie with great depth and great details. This mold would produce a beautiful front piece for a homemade Christmas card. 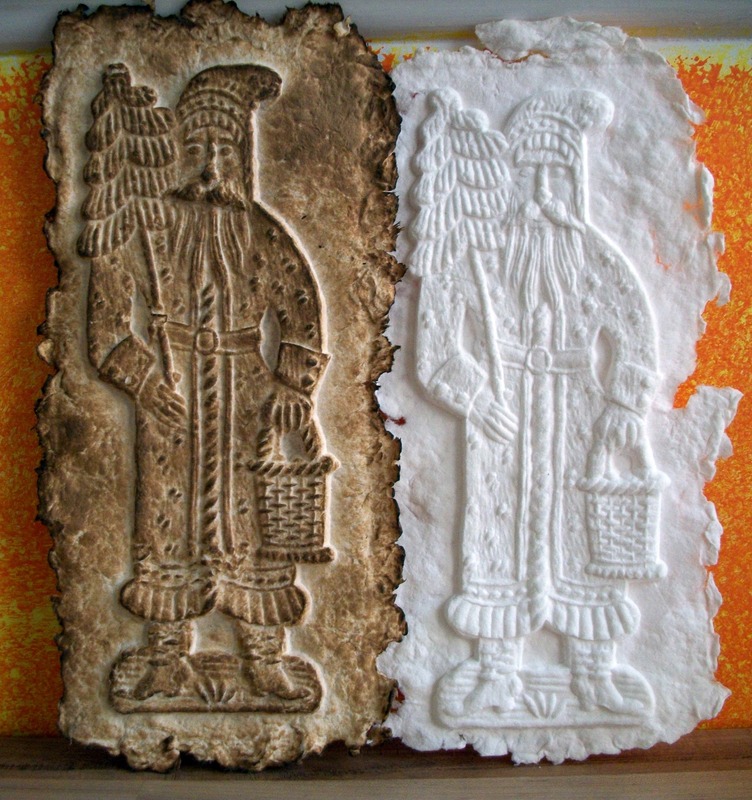 The original mold is from Lorraine, France and is believed to have been carved between 1840 and 1870. This mold is #1724 and sells for $37.52. Cookie made with mold #1724. 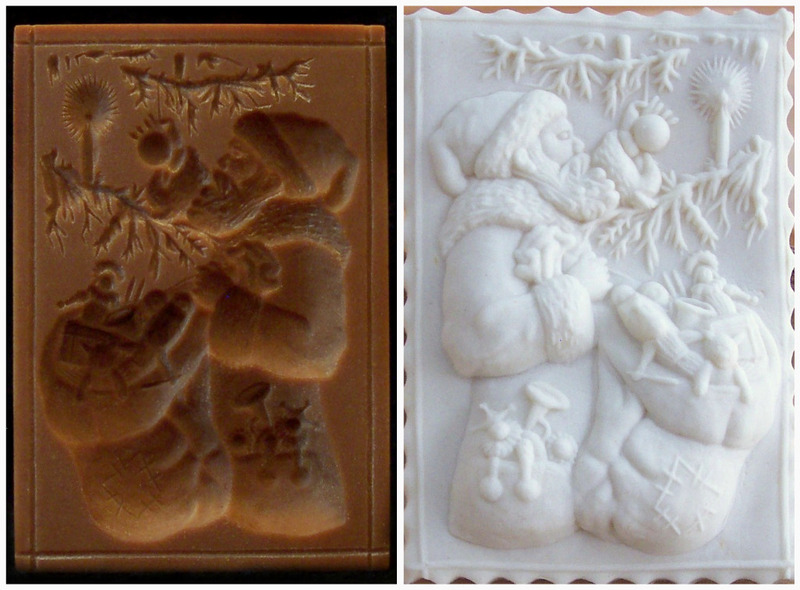 #1685 2012 TSB Santa Mold – $35.75 and limited to only 300 copies. 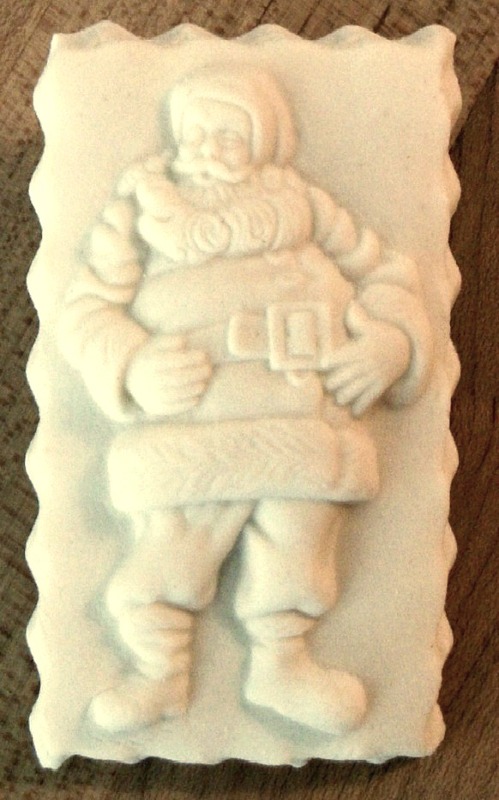 This is our Limited Edition Santa mold from 2012. 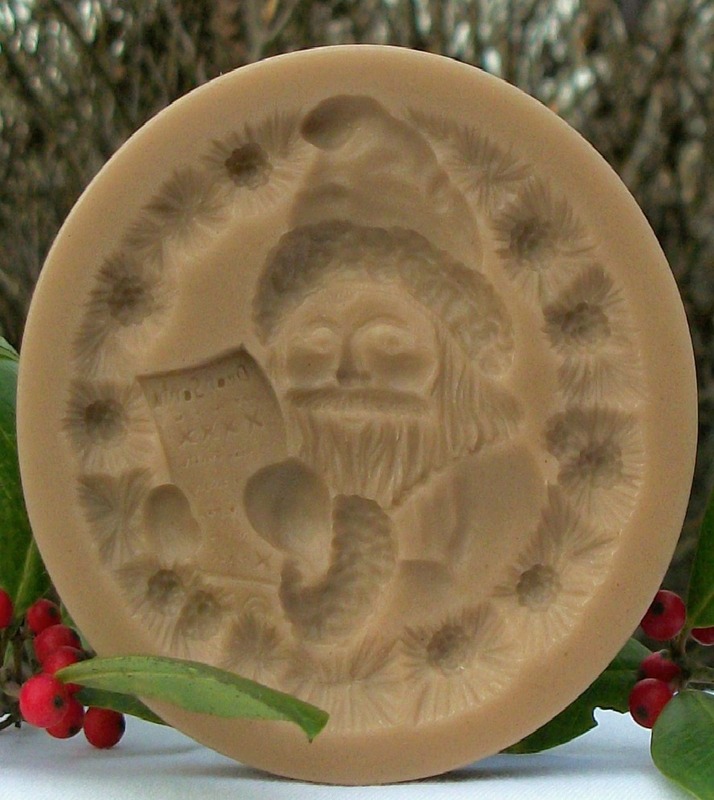 It measures about 3 1/4” in diameter and depicts Santa reading a “Dear Santa” letter from a young hopeful. Santa is ringed by pine needles and cones and the details and dimensions are all very nice. 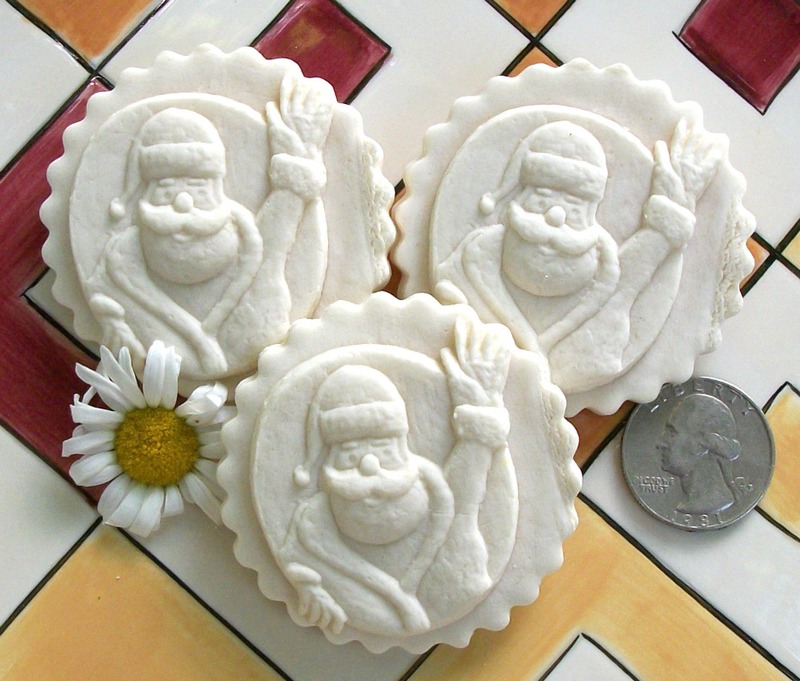 This mold produces a beautiful and memorable cookie that all Santa fans can relate to. 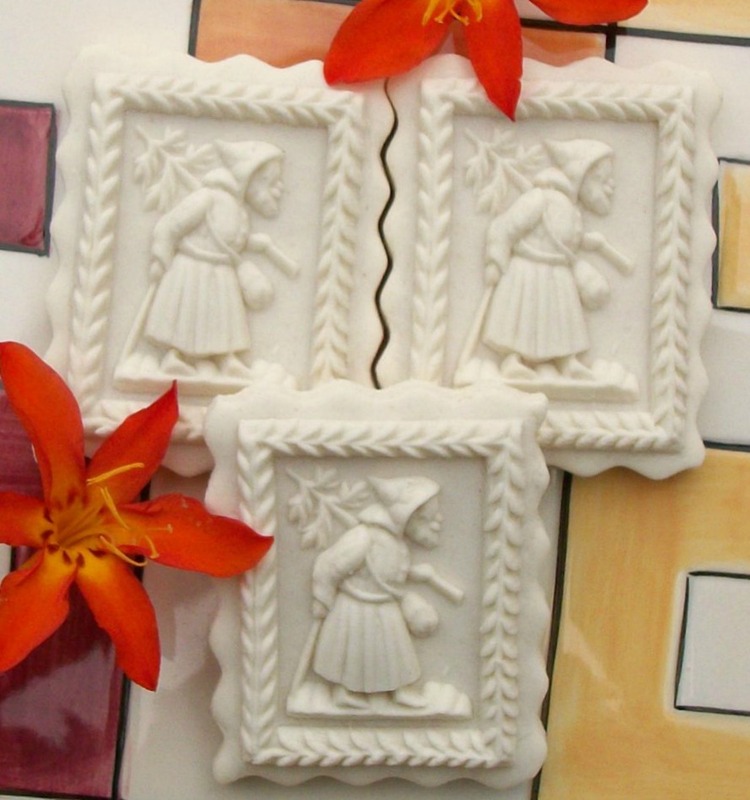 This mold will not only produce cookies, but Marzipan confections, and cupcake toppers as well. This mold is limited to 300 copies and sells for $35.75. 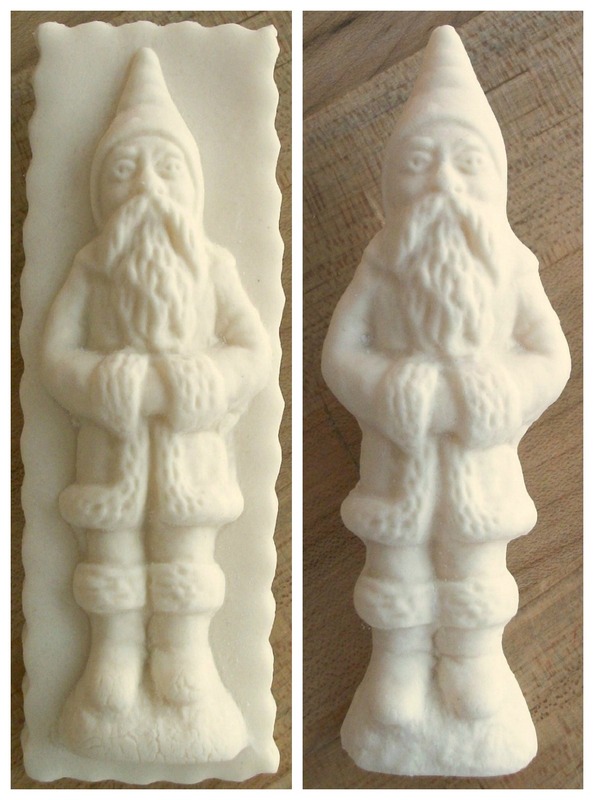 This is our Limited Edition Santa mold from 2011. 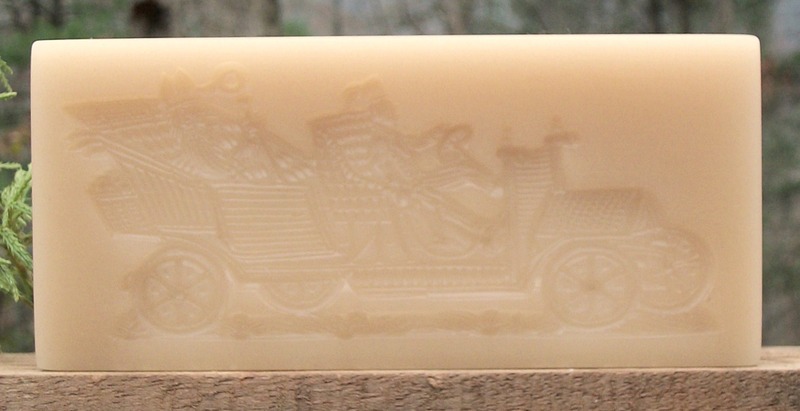 It measures about 4 7/8” x 2 7/8” and depicts Santa riding in his sleigh which is being pulled by his reindeer as a full and bright moon shines above. 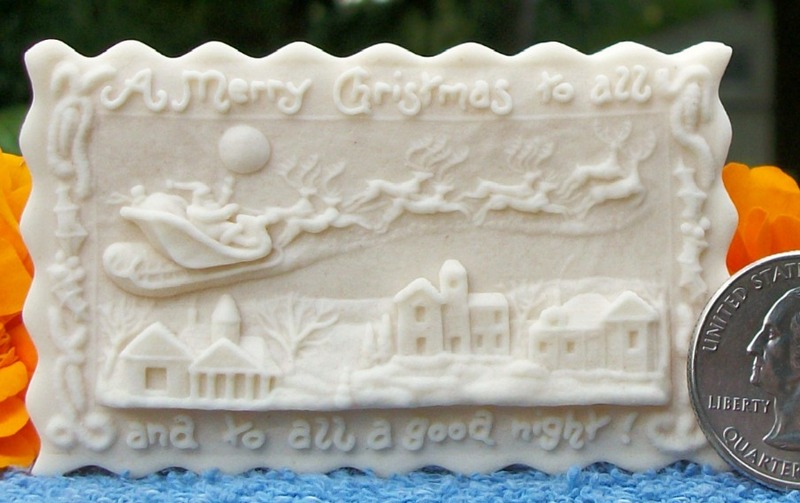 This mold is reminiscent of an old Christmas card and delivers the greeting “A Merry Christmas to all and to all a Good Night!”. Packed with details, you can see the lights strung on the outside of the doors and windows of the houses, the snowman out in the yard, smoke coming from the chimneys, and even a Christmas tree in the window of one of the homes. The cookie or confection this mold will produce can be left whole or the center scene can be cut out to be used alone. This mold is limited to 300 copies and sells for $46.25. This mold is beautiful as a clear mold. You can see the details very well here. Notice the Christmas tree in the window of the house on the left. Being clear will also help with knowing when you have pressed your dough enough. 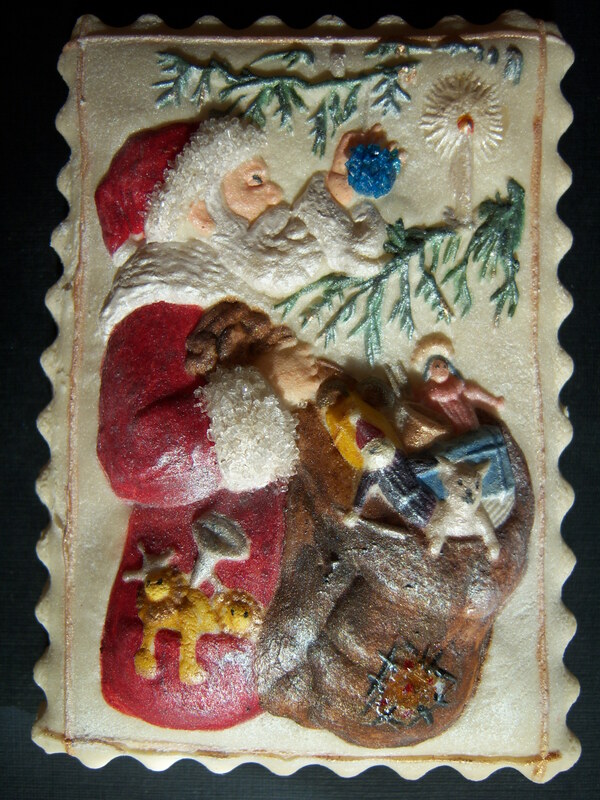 This Santa mold measures about 4 1/8″ x 3 1/2″ and produces an attractive palm sized cookie of Santa riding a donkey. This mold was designed for making Spekulatius cookies but I have used it with Springerle dough with good results. A GREAT mold that will produce a cookie that the little ones will marvel at. This mold is #1636 and sells for $32.95. This is a deep and beautifully detailed mold of Santa during his off season, judging by his size. Maybe he doesn’t get cookies and milk except during his annual deliveries! This is a versatile mold that works well for cookies, Marzipan, paper castings, Paper Clay, and other craft projects. It would also make beautiful ornaments. The mold measures about 5 1/4” x 2 9/16”. This mold is #1909 and sells for $34.95. #1909 Cookie untrimmed and trimmed. 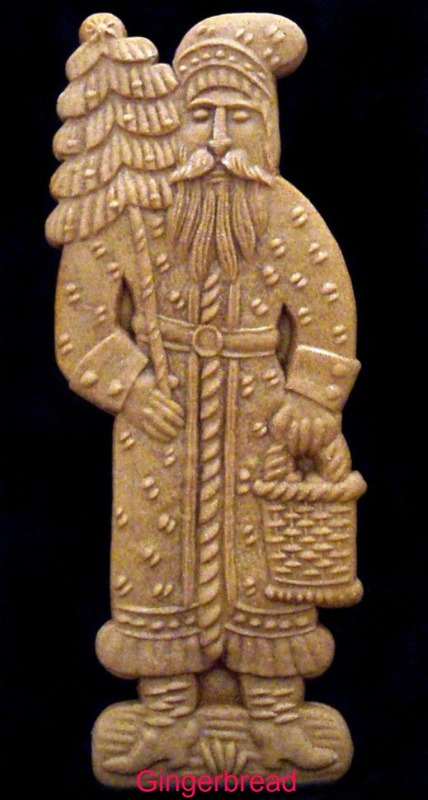 This is a mold of an older version of Santa with his sack on his back and carrying a Christmas tree. This mold works well for cookies and craft projects and measures about 3 5/8” x 2 5/16”. It has good depth and detail. This mold is #2361 and sells for $24.95. 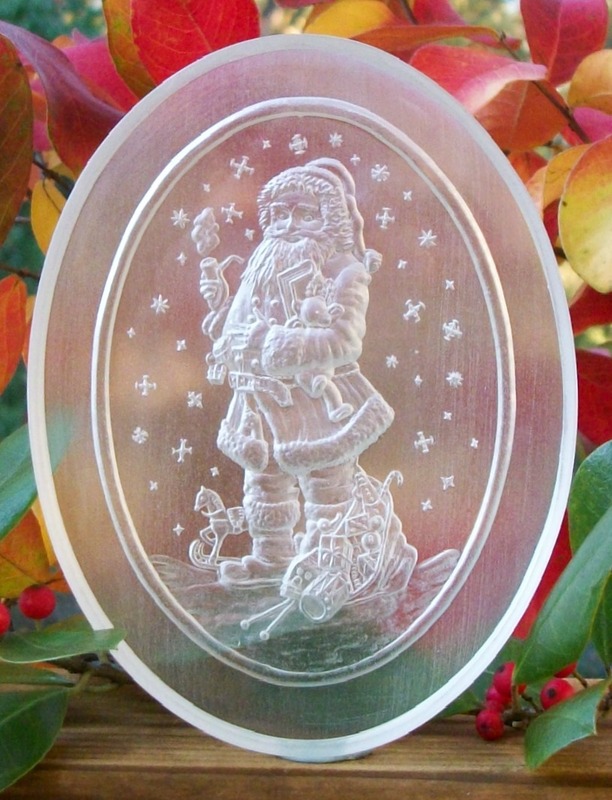 #1609 Geidl Santa Mold – $47.45. 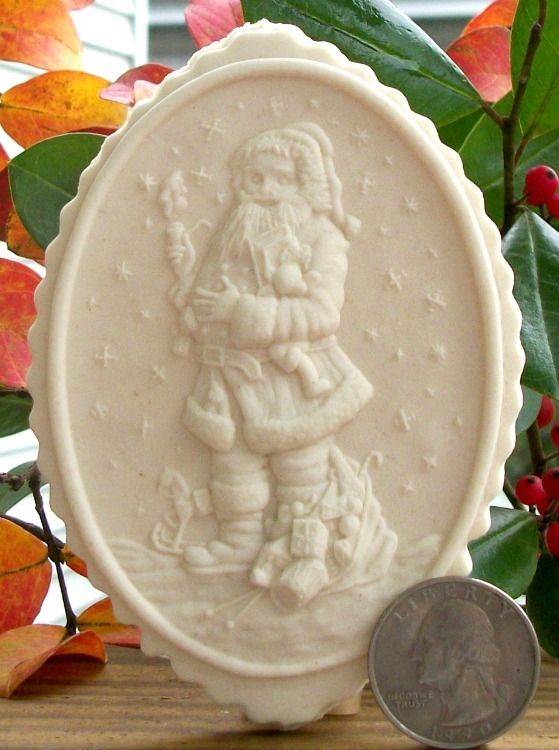 This Santa mold measures about 7 3/4″ x 5 1/4″ and will produce a cookie that measures about 7” x 4 5/8”. The image is very nicely detailed and has good depth and dimension. Santa is carrying a tree and a broom. On the tree there are apples and candles and on his belt are a toy cannon, a ladder, and a pretzel (a bakers symbol). His toy sack looks to be pretty close to empty so he is either just about done with delivers or just about to pack. In addition to cookies this could also be used to produce craft projects. This replica is #1609 and sells for $47.45. The original mold which dates to around 1866 once belonged to a family bakery in Munich, Germany. I am told that it was used at the bakery until 1972 at which time it was given as a wedding gift by the owner to his friend. This mold now resides in a small private collection here in America. 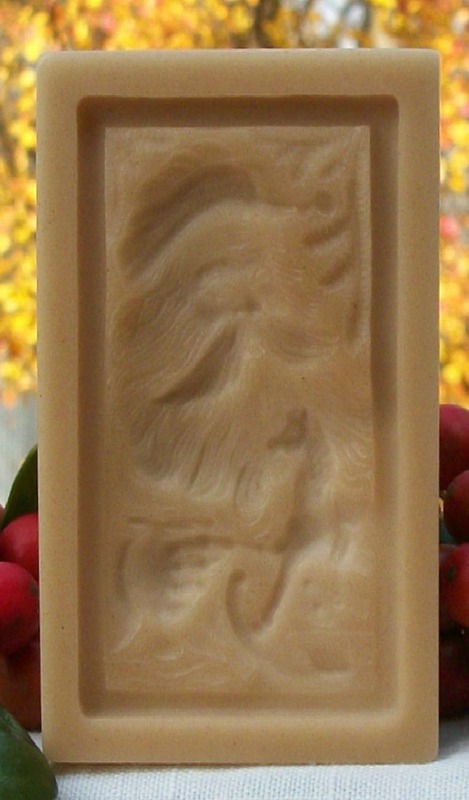 This Santa mold measures about 4 3/8” x about 2 3/8” and is deep, beautiful and nicely detailed. A great size for a cookie tray and for those that make cookie ornaments, Perfect size! 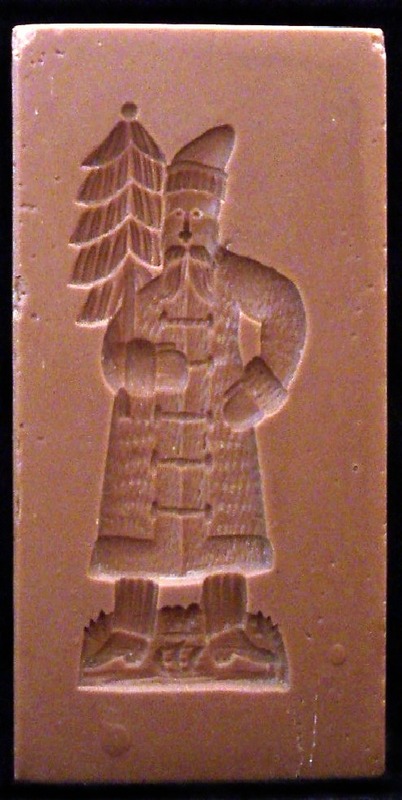 This image is part of a multi-image Spekulatius board that was carved somewhere between 1800 to 1840 and had been in use in a bakery in the town of Freiburg im Breisgau. Freiburg im Breisgau is a city in Baden-Württemberg, Germany. The original board is now part of a collection here in the USA. You can view it here: cookiemolds.wordpress.com/in-the-workshop This mold is #1513 and sells for $28.75. 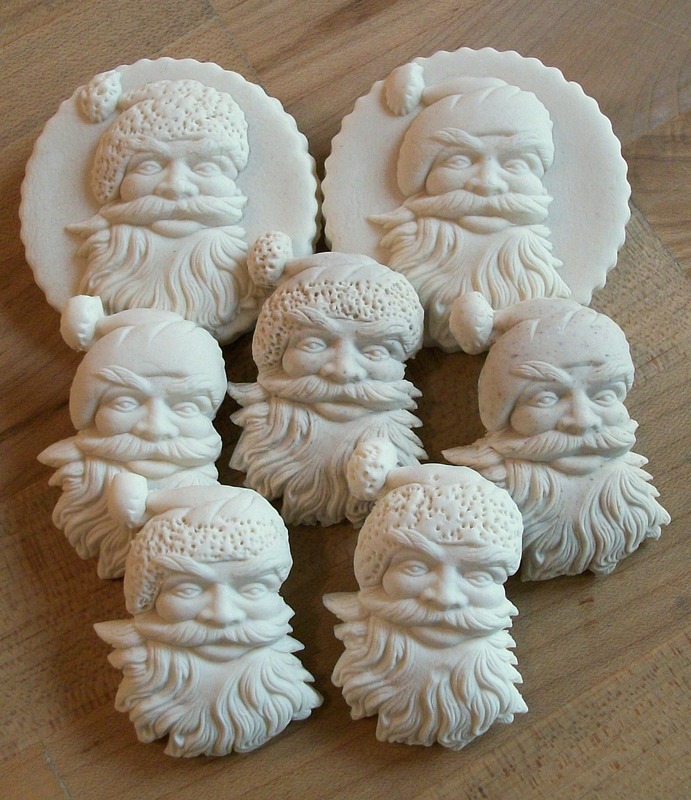 This is our Limited Edition Santa mold from 2010. 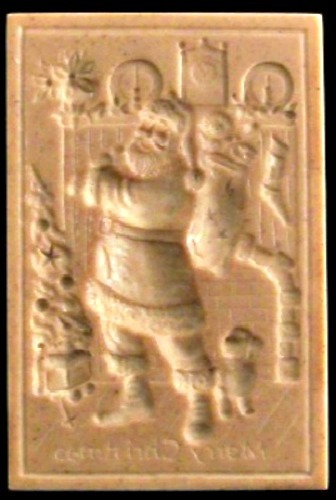 This mold showing Santa shouldering his toy sack, after unloading your toys, is the second Santa in a planned series produced exclusively for The Springerle Baker. It’s packed with details such as the ornaments on the tree, the dial on the clock, the fur on Santa’s coat, the brick work in the fireplace, and the toys in Santa’s sack. The watchful puppy at Santa’s feet looks to be wondering what this stranger is doing. 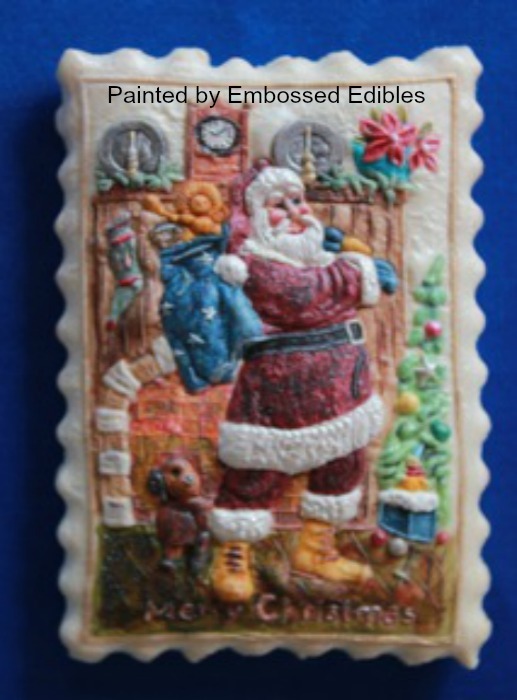 This mold was designed to not only be a cookie but to relay a “Merry Christmas” greeting just as an old postcard would have. The greeting is a simple one but will fit in nicely with an assortment of cookies given as a gift. This cookie if painted would be a great looking Christmas Card Postcard. If you make marzipan, this is a good size for candy too. Measuring 3 7/16″ x 2 1/4″ and about 3/16″ at its deepest part, this mold is #1555 and sells for $41.00. Only 300 copies of this mold will be available. #1555 Cookie with fluted edge. 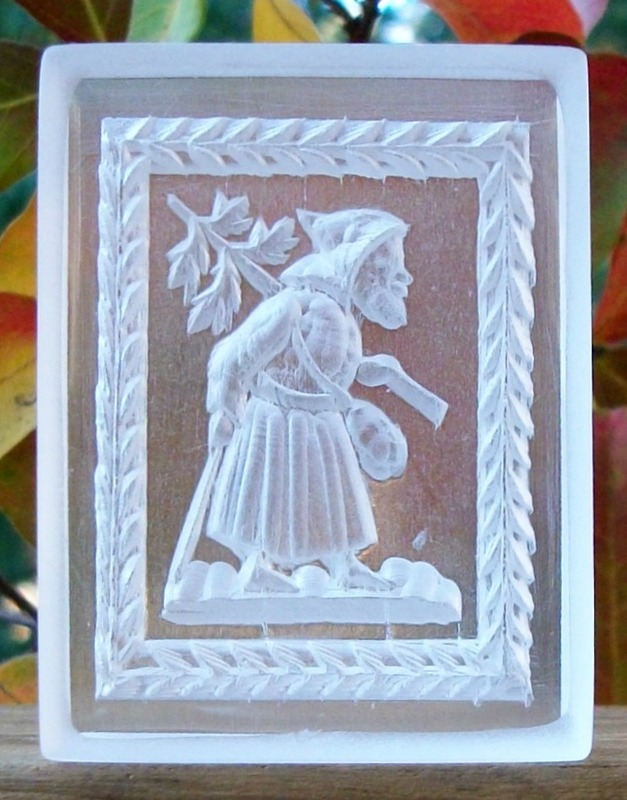 #1554 Small Bavarian Santa Mold – $23.95. This mold of a small Santa in full robe and gloves that is very nicely detailed measures about 3 3/4” x about 2”. 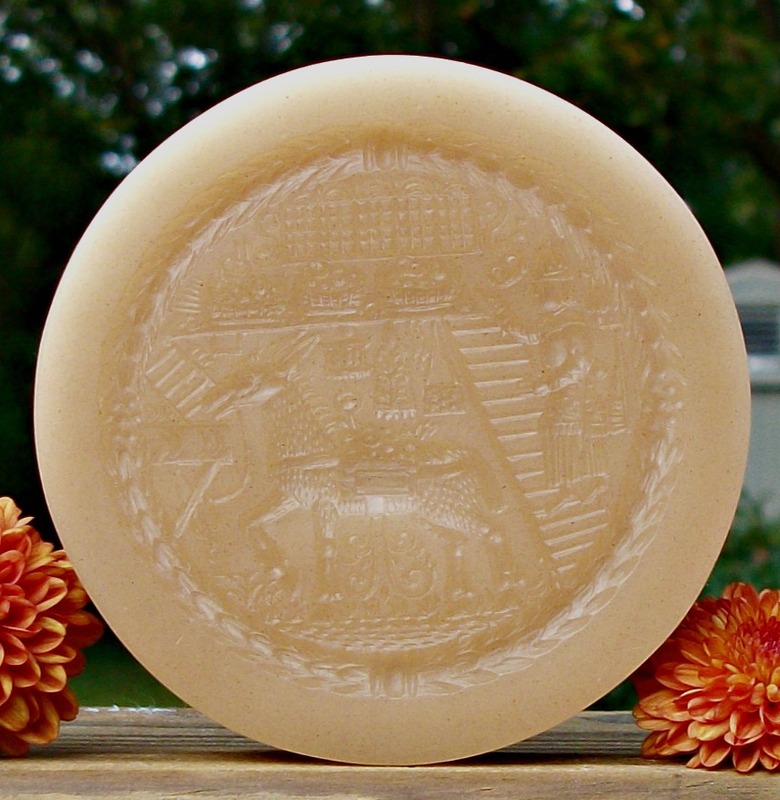 The original mold was used by the A. Kempf bakery in Nurnberg in the mid to late 1800’s. You can see the details it will reproduce in a candy like the Marzipan piece pictured. It can also be used for cookies. This mold is item #1554 and sells for $23.95. 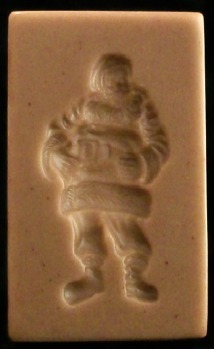 Marzipan Candy Santa made with mold #1554. #1539 Santa with Tree Gingerbread cookie. 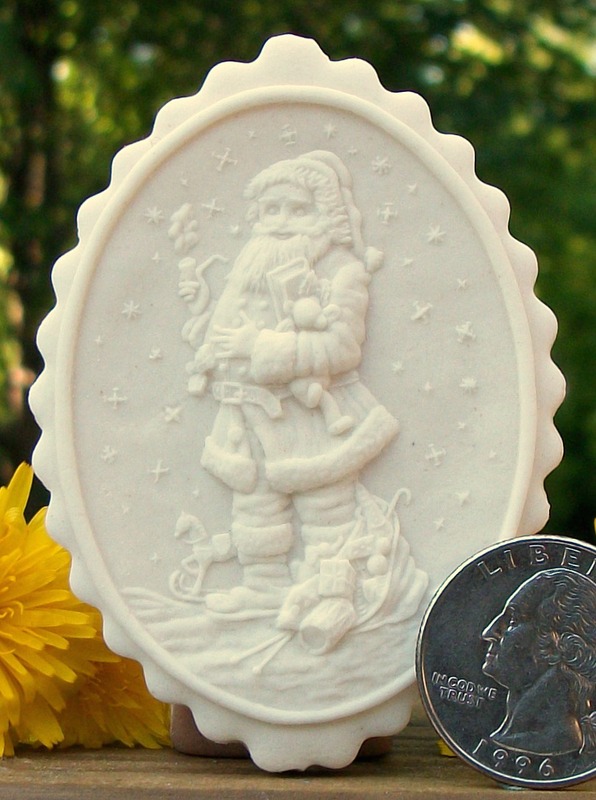 This “Memory Maker” Santa mold measures about 15 7/8″ x 7″ and produces a cookie that measures 13 3/4” x 5”. A very big and impressive cookie that would be a great and memorable gift to any young child; thus a “Memory Maker”. The image is very detailed and has good depth and dimension. 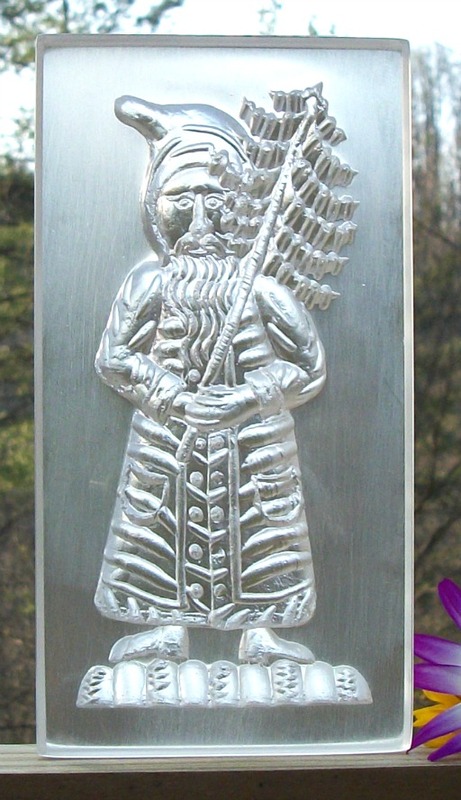 This mold is referred to as a “Memory Maker” by The Springerle Baker and is one of our exclusive molds. This mold is #1543 and sells for $122.27. Clear and tinted copies of this mold will cost an extra $15.28. 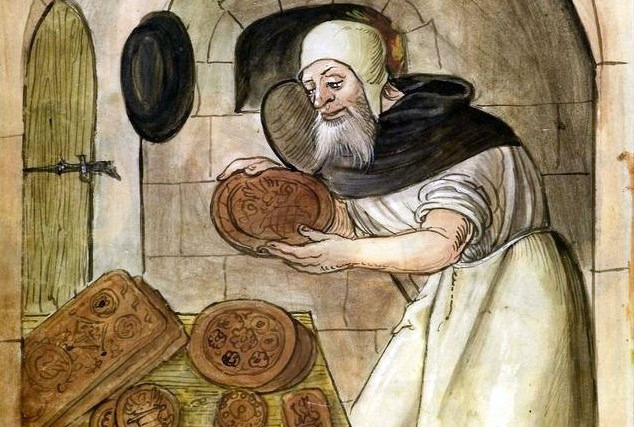 The original mold which dates to around 1831 came from an old bakery in Bonn, Germany. 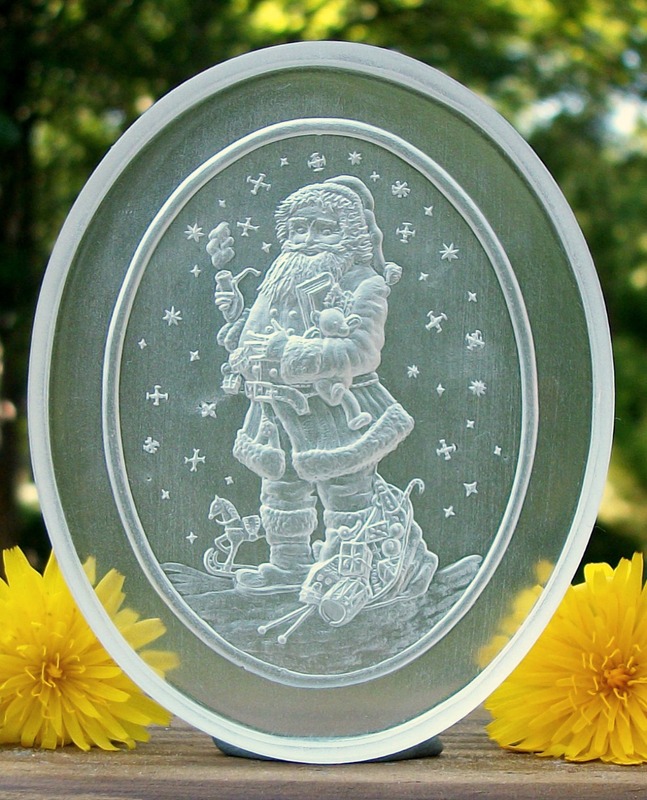 #1542 Bamberg Santa Mold – $143.95. This mold measures about 18 3/4” long x 7 1/4” at top and tapering down to 5 1/2” at the bottom. This mold has great depth, dimension, detail, and character and depicts an early Santa with toys in his coat pocket as well as on the tree he’s carrying. I refer to this Santa as a Woodlands Santa because he wears more of a woodmans or Odins style hat as opposed to the cap we are so used to seeing Santa in. The cookie produced from this mold measures about 15 5/8” x 5 1/2” and is sure to be a “Memory Maker” for children, young and old alike. Carved around 1802, the original wooden mold comes from a town called Bamberg which is located in Bavaria, Germany. This mold is #1542 and sells for $143.95. Gingerbread Cookie made with mold #1542. 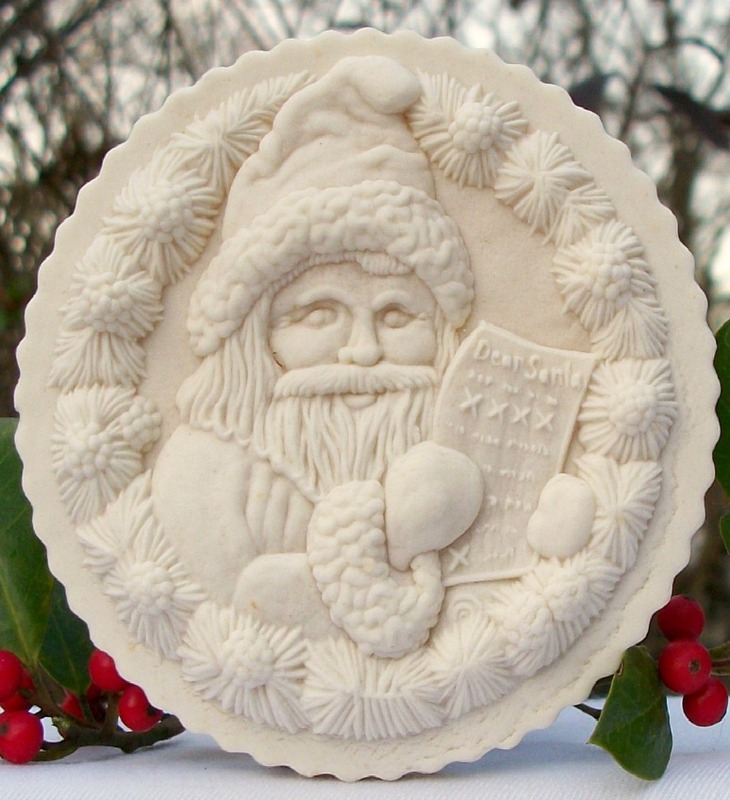 This “Memory Maker” Santa mold measures about 12″ x 5″ and produces a cookie that measures 10 3/4” x 4 1/4”. A very grand and impressive cookie. This mold is referred to as a “Memory Maker” by The Springerle Baker and is one of our exclusive molds. The image is very detailed and has good depth and dimension. This mold is item #1528 and sells for $62.95. The original mold which dates to around 1856 came from an old bakery in Aachen Germany. The original mold now resides in the Mildred E. Jenson Collection. This “Memory Maker” Santa comes from Aachen, Germany and dates to about 1856. It measures 11 3/8″ x 5 1/4″ x 5/8″ and produces a cookie that measures 10 5/8” x 4”. A very grand and impressive cookie that any child would be excited to receive and would remember for years to come. This mold is referred to as a “Memory Maker” by The Springerle Baker and is one of our exclusive molds. The original mold now resides in the Mildred E. Jenson Collection. This mold is #1527 and sells for $78.12. A clear or color tinted copy of this mold will cost an extra $9.77. A true “Memory Maker” for the young ones in your life. This mold makes a great Santa. The first time I made him I was hooked as his size is just about perfect and his features make this a very handsome cookie. If after you trim him you gently stretch the cookie from both top and bottom he will become a Pencil Post Santa. Nothing says he has to be the same shape all the time. I do this by putting a spatula under his head and feet and gently pull. Paper Castings made with mold #1527. Tea stained on the left. This would make a great framed piece that would last for generations. 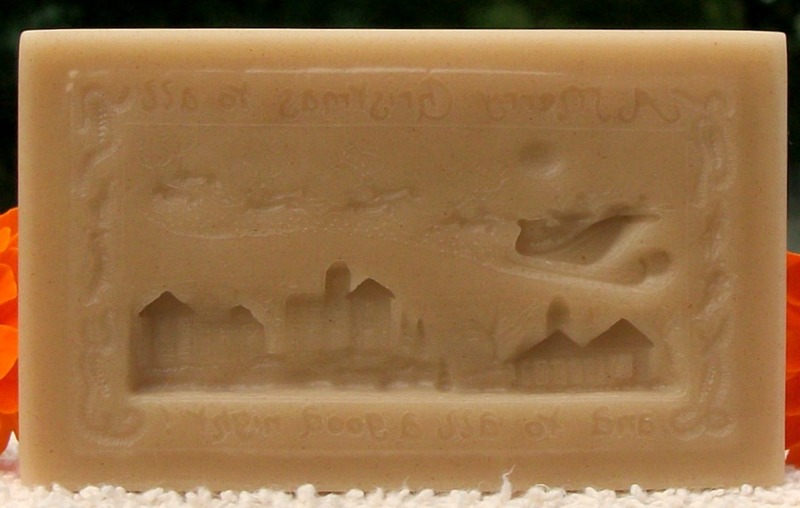 #1524 Biberach an der Riss Santa Mold – $72.20. 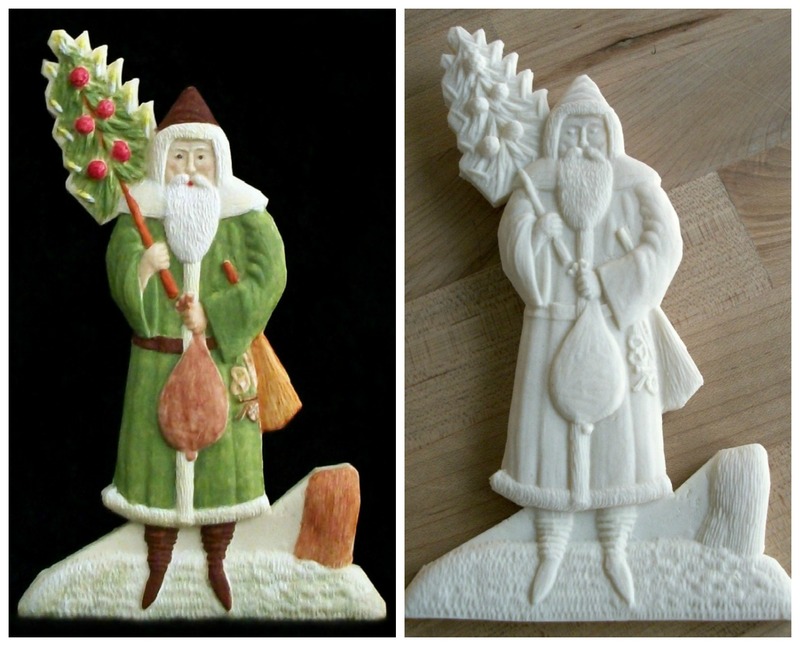 An “Old World” Santa design that comes from the town of Biberach an der Riss in Germany and dates to about 1850. The mold measures 10 3/8″ x 5 5/8″ and will produce a very dimensional cookie, confection or piece of art work that measures about 8″ x 3″. Using edible colors, this Santa will look his best in a blue or perhaps forest green coat. Paper castings from this mold are equally impressive and would make a great framed 3D picture. This mold is #1524 and sells for $72.20. 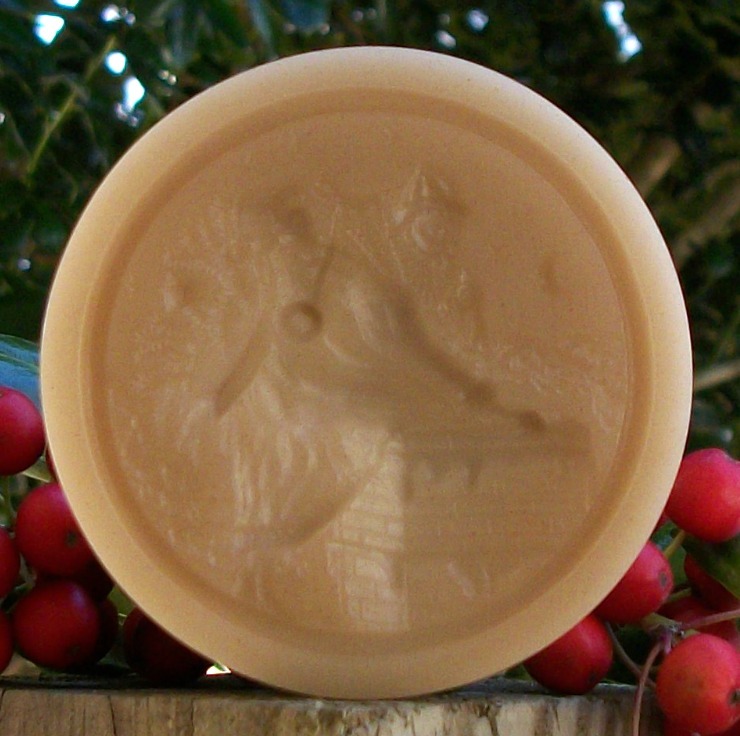 A clear or color tinted copy of this mold will cost an extra $9.00. A true “Memory Maker” for the young ones in your life. Cookies made with mold #1524. Made with Springerle dough – painted with edible Petal Dusts and made with a Gingerbread dough. 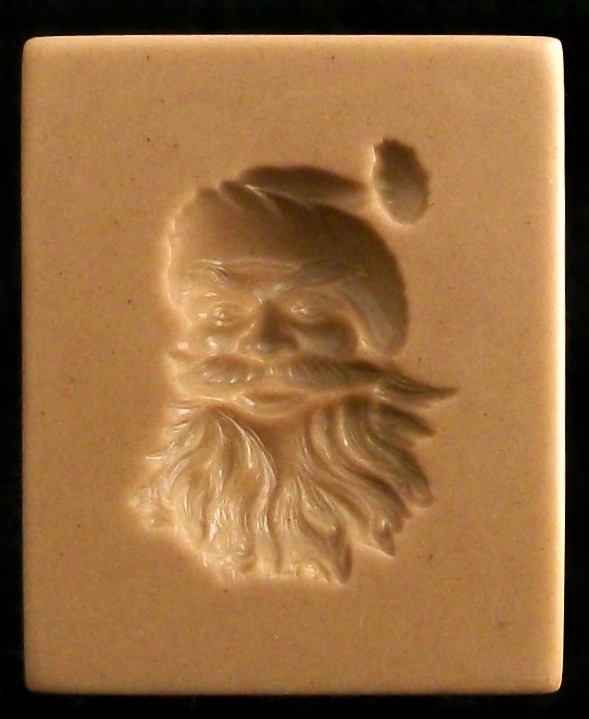 This is our Limited Edition Santa mold from 2009. It was the first Santa in a planned series produced exclusively for The Springerle Baker. This mold shows Santa hanging an ornament before unloading your toys. It will produce a cookie with great depth and dimension as well as detail. Notice the fur on Santa’ s coat and hat, the hairs on his beard, and the details on the toys. It can also be used for craft projects. This mold measures 3 5/8″ x 2 1/2″ x 1 3/4″ and is about 1/4″ at its deepest part. It’s mold #1505 and sells for $41.00. #1654 SMALL Riss Santa Mold- $31.95. An “Old World” Santa design that dates to about 1850. This mold measures 4 7/8″ x 2 3/8″ and will produce a very dimensional cookie. Beautiful in detail and stature. If you have young ones or would just like to add to your cookie gift boxes, this small Santa will make an impression. A must have for the holiday cookie giver! This is a smaller version of mold #1524. This mold is item #1654 and sells for $31.95. Cookie made with mold #1654. #413 Small Aachen Santa w Tree Mold – $42.95. This smaller version of our “Memory Maker” Santa mold measures about 6″ x 2 ¾” and produces a very handsome and nicely detailed Santa. If after you trim him you gently stretch the cookie from both top and bottom he will become a Pencil Post Santa. Nothing says he has to be the same shape all the time. I do this by putting a spatula under his head and feet and gently pull. Being small, this Santa can be used with Springerle, Spekulatius (thin and crisp), Tirggel or Marzipan dough. This mold will also produce great Ornaments. The mold is #413 and sells for $42.95. Cookie made with mold #413. This smaller version of our “Old World” Santa mold #1539 measures about 4 5/8″ x 2” and produces a very handsome and proper Santa. He carries a basket of fruit and a Christmas tree. Being small, this Santa can be used with Springerle, Spekulatius (thin and crisp), Tirggel, or Marzipan dough. This mold will also produce great Ornaments. The mold is #418 and sells for $34.25. 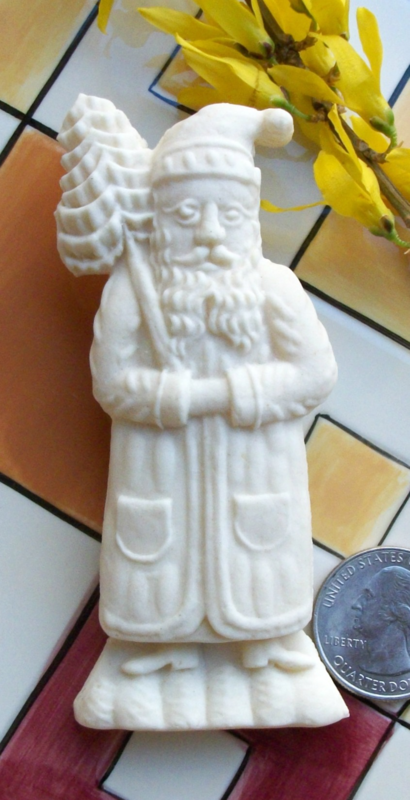 #428 Small Cologne Santa with Broom Mold – $32.50. This smaller version of our “Old World” Santa mold #1540 measures about 4 3/16″ x 1 3/4” and produces a very handsome and proper Santa. He has great depth and details and carries a basket of fruit and a broom and is also referred to as the star Santa due to the star on his hat. Being small, this Santa can be used with Springerle, Spekulatius (thin and crisp), Tirggel or Marzipan dough. This mold will also produce great ornaments. The mold is #428 and sells for $32.50. Cookie made with mold #428. 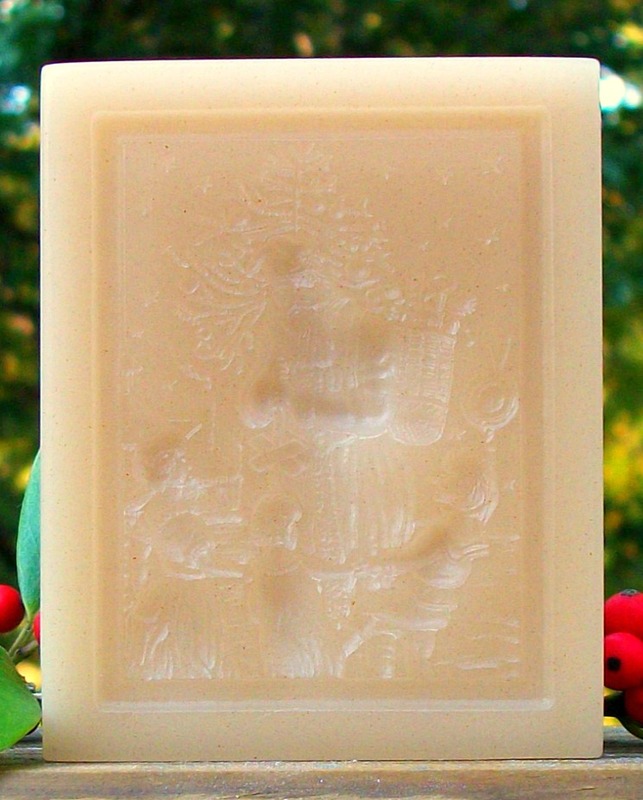 #430 Small Santa Riding a Donkey Mold – $22.50. 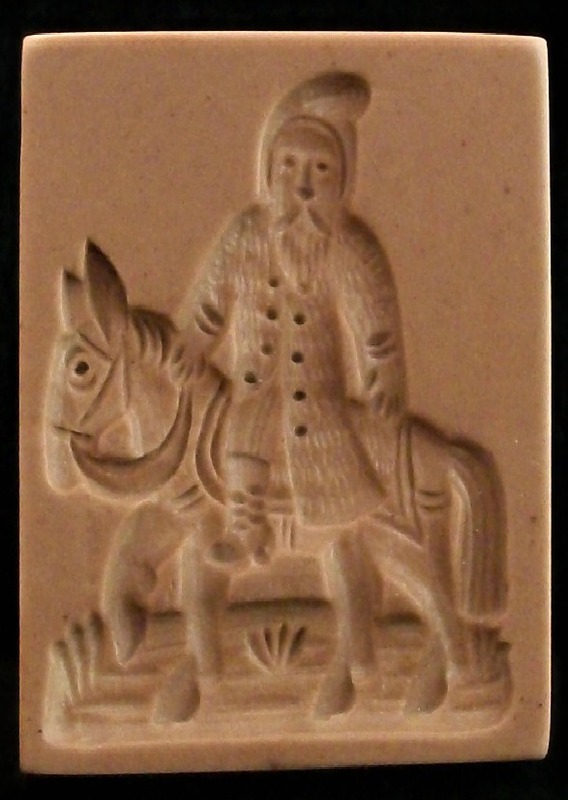 This mold of Santa riding a donkey measures about 2 1/4″ x 1 7/8″ and produces a very detailed and dimensional cookie or confection for your holiday cookie or dessert plate. This mold is #430 and sells for $22.50. This mold is a smaller version of #1636. Cookie made with mold #430. 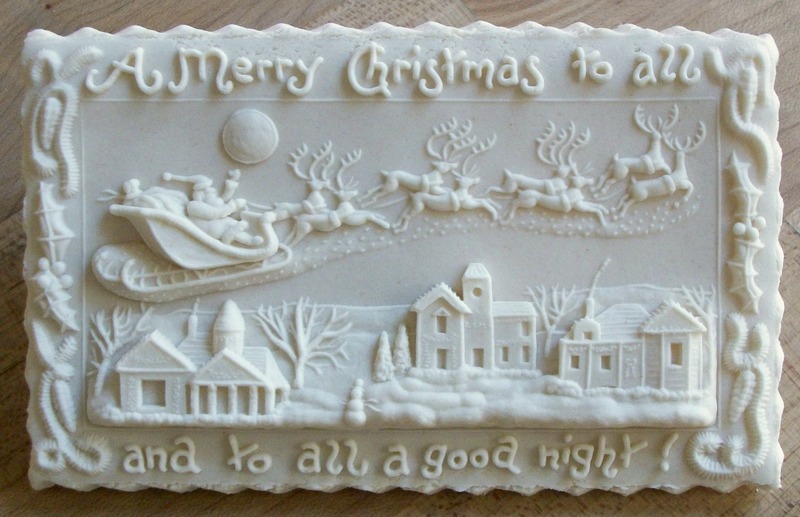 #438 Small “A Good Night To All” Santa Mold – $34.95. 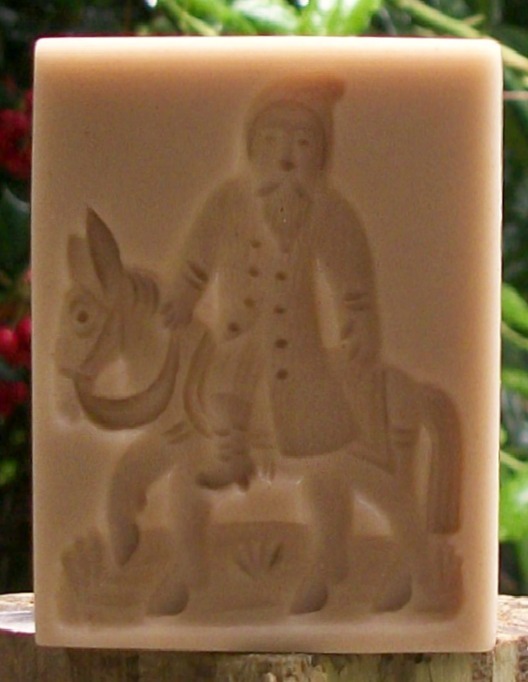 This mold measures about 3 3/16” x 2” and depicts Santa riding in his sleigh being pulled by his reindeer as a full and bright moon shines above. 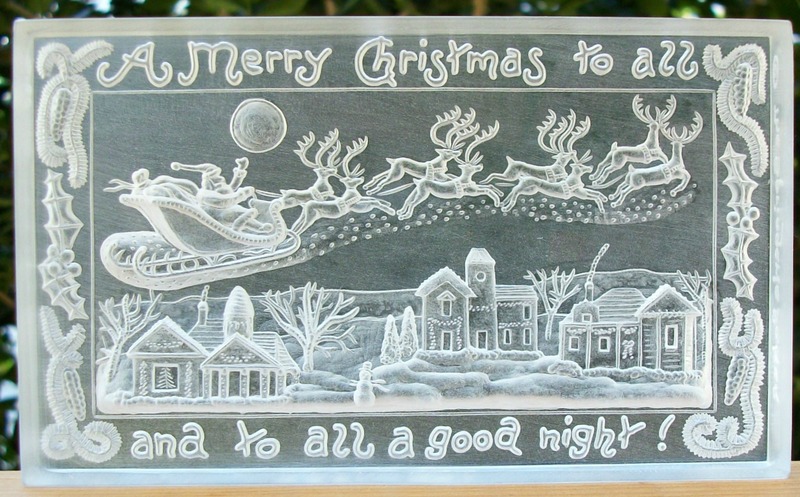 This mold is reminiscent of an old Christmas card and delivers the greeting “A Merry Christmas to all and to all a Good Night! A snowman sits out in the yard as smoke rises from chimneys. You can almost hear the jingle of the bells on Santa’s sleigh. A perfect fit for your cookie tray or dessert display. This mold is #438 and sells for $34.95. A clear or color tinted copy of this mold will cost an extra $4.37. 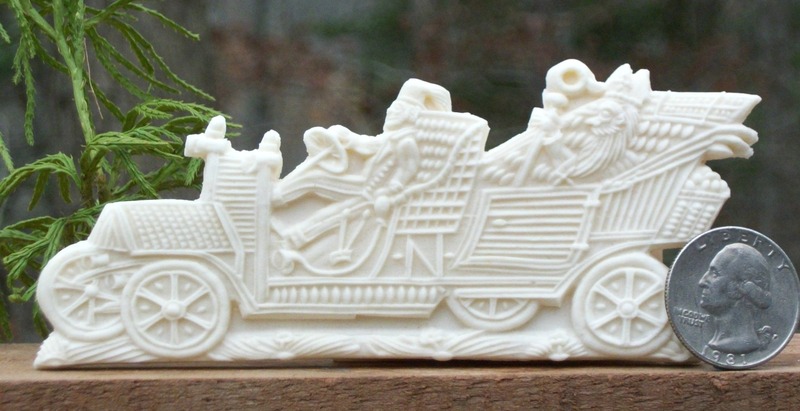 This mold is a smaller version of our 2011 TSB Santa mold #1632. This smaller size was created because folks liked the design of #1632 but wanted a small size to fit in an assortment. #1632 was designed to be given as a Christmas greeting card cookie by itself. Cookie made with mold #438. 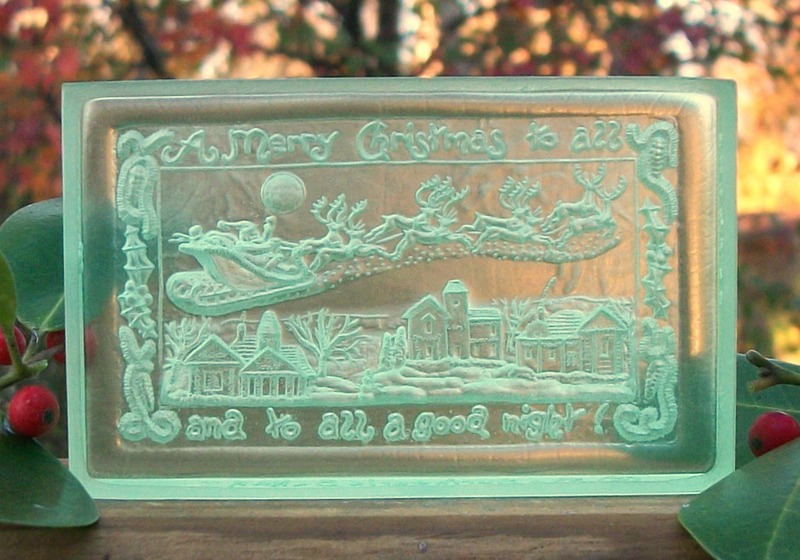 #438 Small “A Good Night To All” Santa mold in Clear Green. – $39.32. Viewing from the backside. 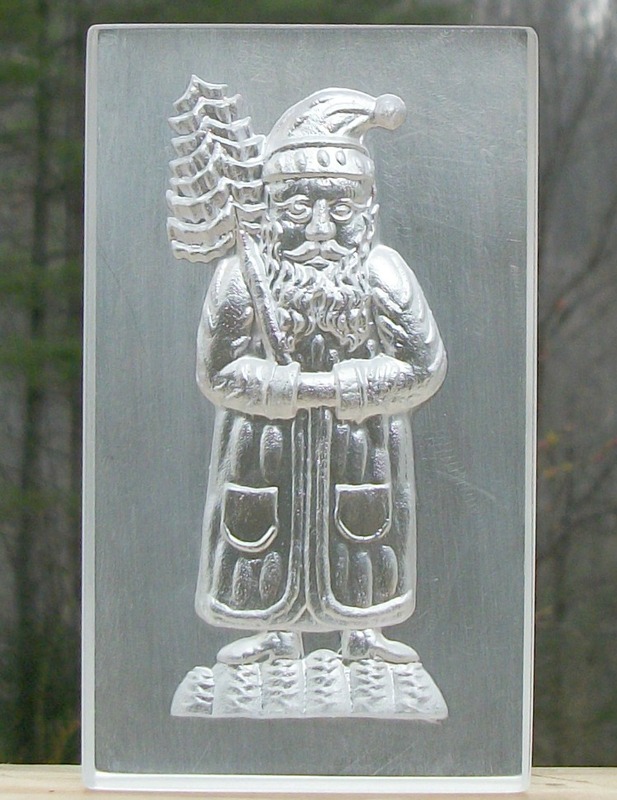 #443 Small Bamberg Santa Mold – $63.58. 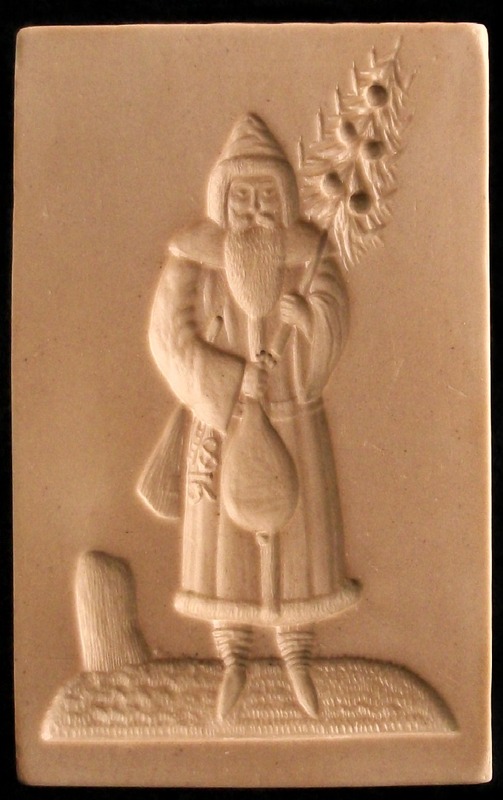 This mold measuring about 9 3/4” x 4 1/4” depicts an early Santa with toys in his coat pocket as well as on the tree he’s carrying. I refer to this Santa as a Woodlands Santa because he wears more of a woodmen’s or Odin’s style hat as opposed to the cap we are so used to seeing on him. He wears two feathers on his hat and his long curly hair hangs low onto his shoulders. His mustache and beard are quite wavy thus also helping to give him a unique look. 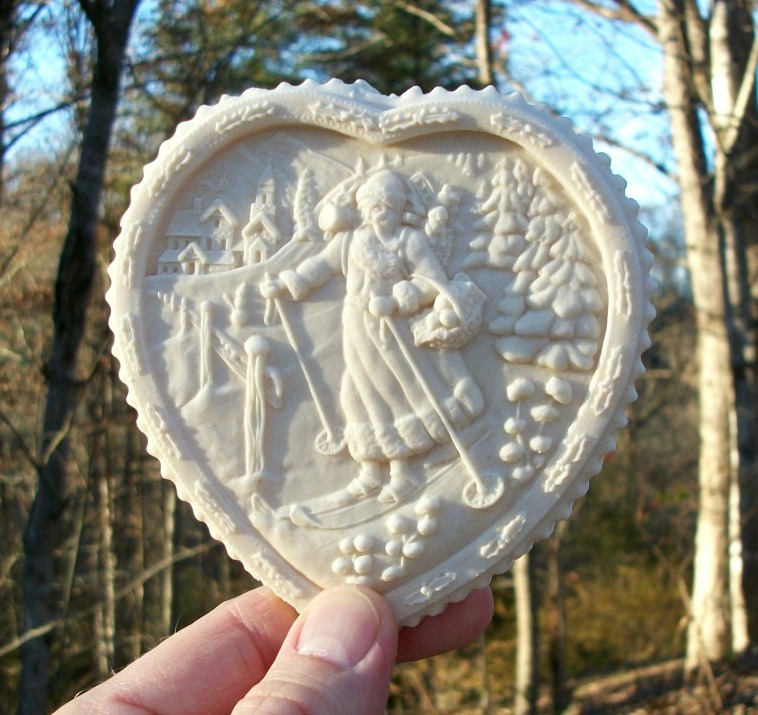 The cookie produced from this mold measures about 8 3/16” x 3” and will have great depth, dimension, detail and character. It is sure to be a “Memory Maker” for the children young and old alike. If painted with edible colors, the word beautiful comes to mind. This mold is #443 and sells for $63.58. Cookie made with mold #443. #448 Junior Bamberg Santa Mold – $41.95. With all the details, depth and dimension of the original Bamberg Santa this much smaller version measures about 5 1/4” x 2 ¼”. This is an early Santa with toys in his coat pocket as well as on the tree he is carrying. I refer to this Santa as a Woodlands Santa because he wears more of a woodmen’s or Odin’s style hat as opposed to the cap we are so used to seeing on him. He wears two feathers on his hat and his long curly hair hangs low onto his shoulders. His mustache and beard are quite wavy thus also helping to give him a unique look. 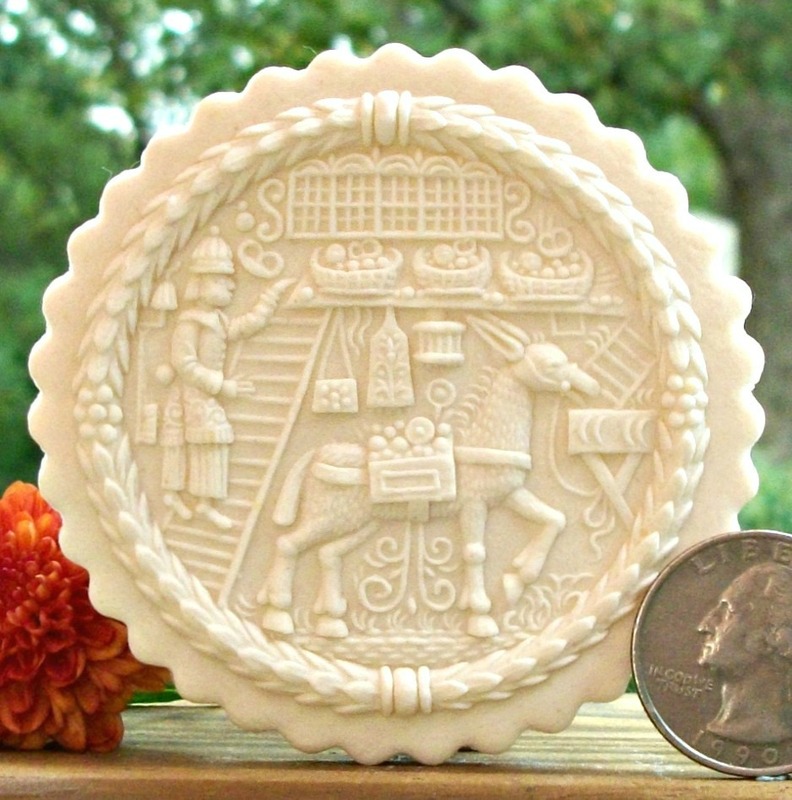 The cookie produced from this mold measures about 4 1/2” x 1 ½” and delivers amazing detail and character. It’s sure to be a “Memory Maker” for the children young and old alike. If painted with edible colors, this cookie would make an amazing edible work of art. This mold is #448 and sells for $41.95. This mold is a small version of #443. Cookie Made with mold #448. #449 Small Calw Santa Mold – $37.96. 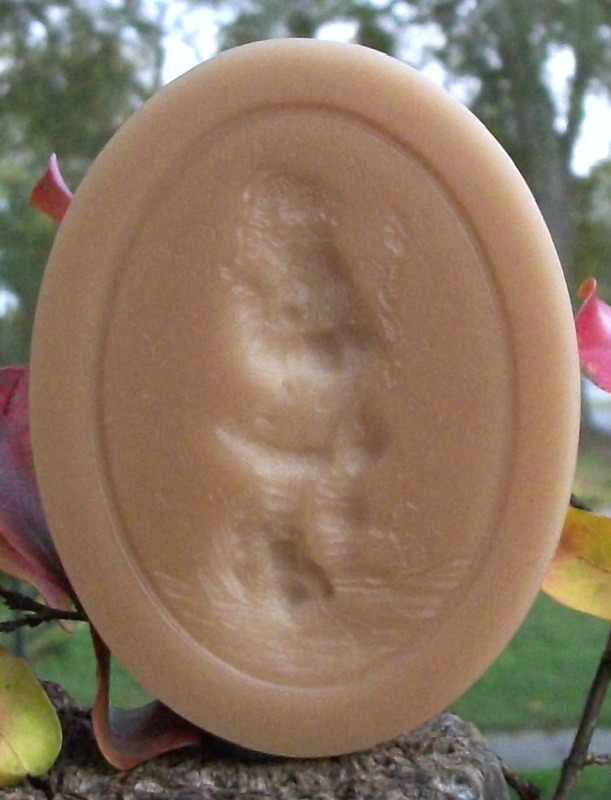 This mold measures about 4 ½” x 2 ¼” and produces a very deep image of Santa. He carries a tree and switches so he is prepared for both good and naughty children. He is just about the right height to be applied to the side of a two or three layered cake. He makes a great cookie but he can be so much more. This mold is #449 and sells for $37.96. Cookie made with mold #449. #495 Small Santa with Pipe Mold – $32.78. 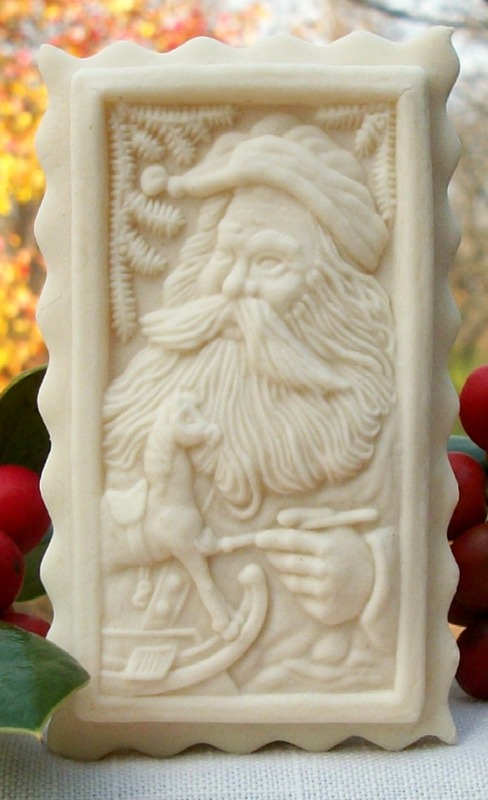 This mold measures about 3″ x 2 5/16″ and shows Santa taking a pause in his work to enjoy his pipe. Nicely detailed with overall good depth and dimension. Santa is holding his book with the names of all the good boys and girls he needs to visit. At his feet are his toy sack (brimming with all sorts of toys) and a fine handcrafted rocking horse. You will also see snowflakes falling around Santa. The image has a simple oval ring border which gives the scene an overall picturesque look. In addition to using this mold to produce beautiful cookies, it can also be used to produce ornaments and greeting cards. This mold is a smaller version of our 2015 TSB Santa mold #1772. This mold is #495 and sells for $32.78. Clear copies of the mold are an extra $4.10. Great design for creating your own Christmas cards! Cookie made with mold #495. 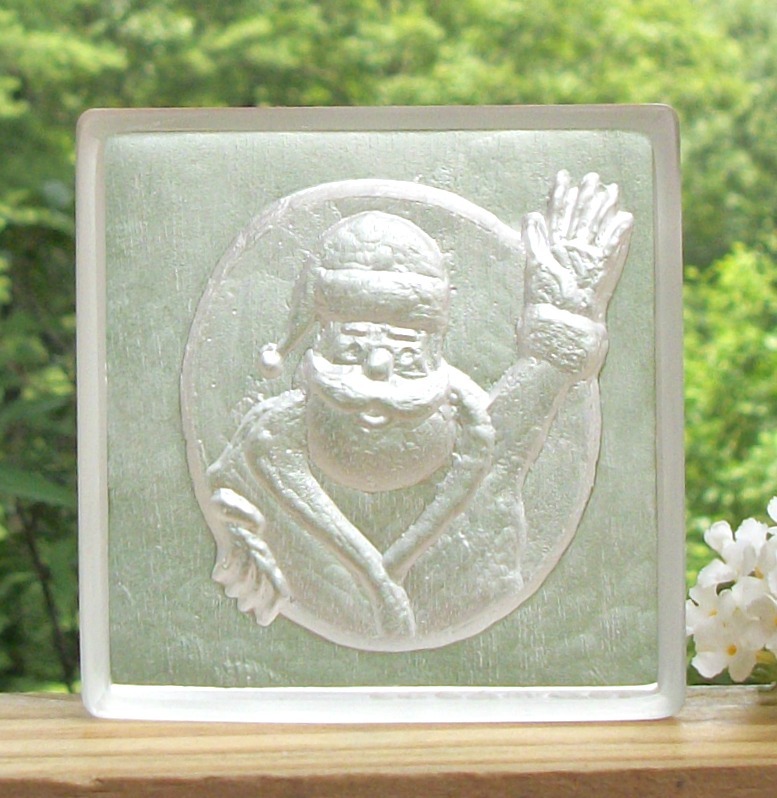 #495 Small Santa with Pipe Mold in Clear. 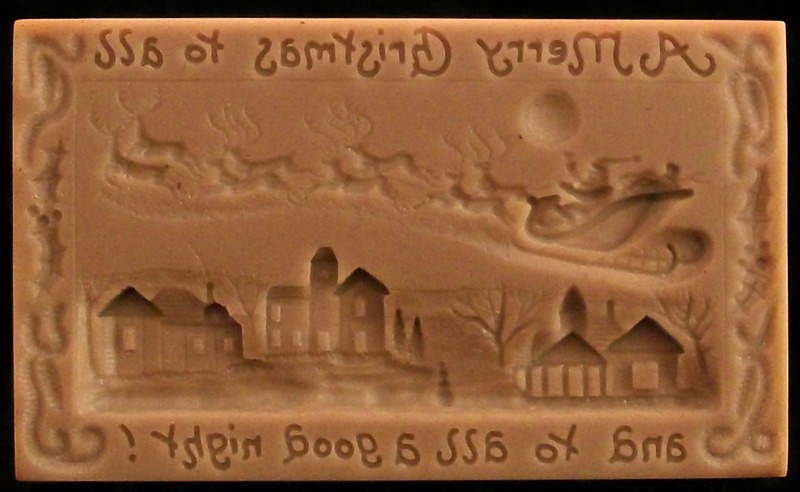 This TSB exclusive mold measures about 2 3/4” x 2 1/8″ and depicts Santa journeying through a village. Some children see him and are so excited to greet Santa, that they rush outside without their coats. 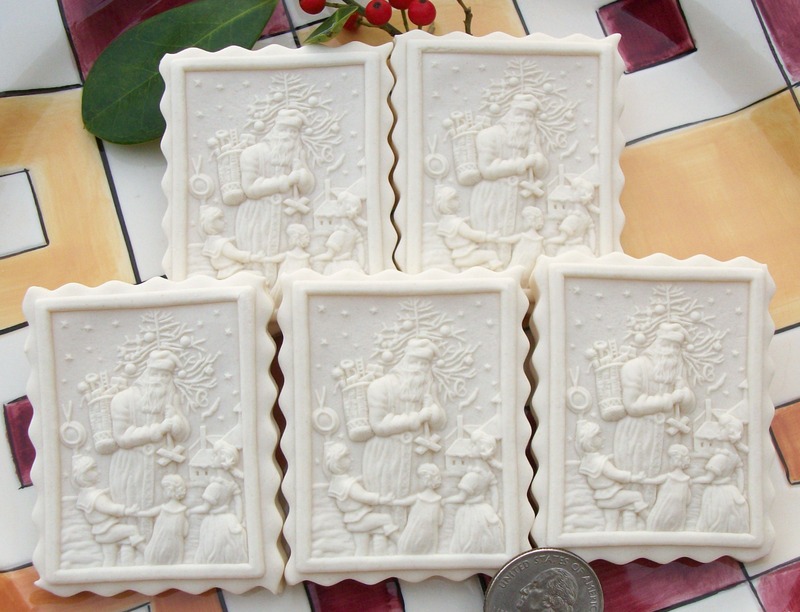 In addition to using this mold to produce beautiful cookies, it can also be used to produce ornaments and greeting cards. This mold is packed with very fine details which add to the magic of this scene. This mold is limited to 300 copies. This mold is #1797 and sells for $40.36. Clear copies of the mold are an extra $5.05. Cookies made with mold #1797. #1884 Saint Nicholas with Crozier Mold – $46.89. 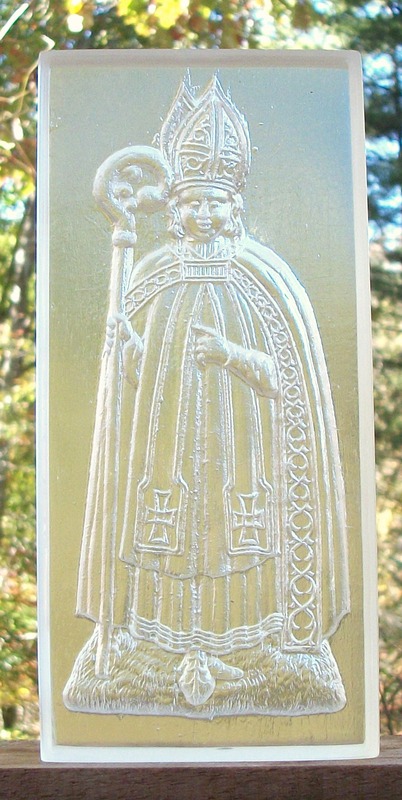 This mold of Saint Nicholas holding a crozier measures about 7″ x 3 1/4″. A crozier (staff) is a general symbol for bishops, but unique to Nicholas. 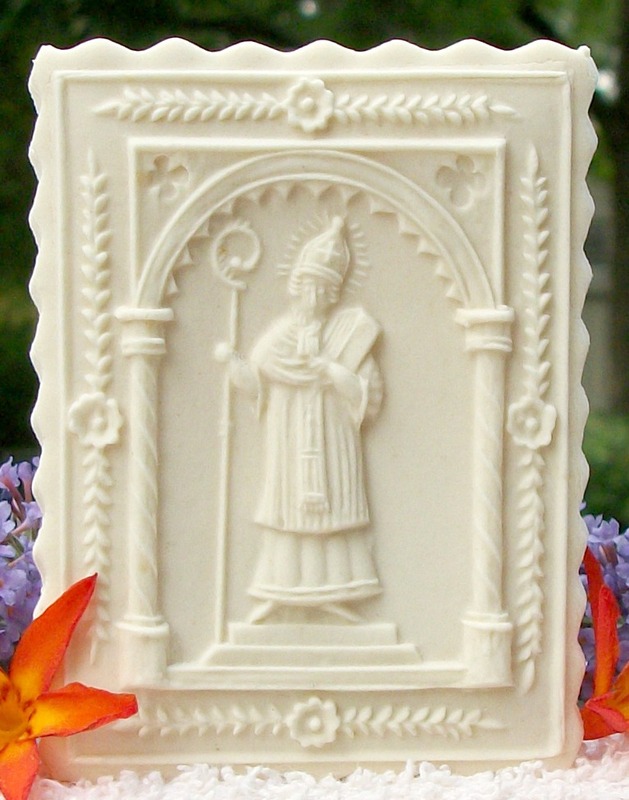 This mold will produce a good sized Saint Nicholas with nice details and depth. Perfect for Saint Nicholas Day, December 6th. The mold has grooves on its sides to assist in lifting it from the dough. 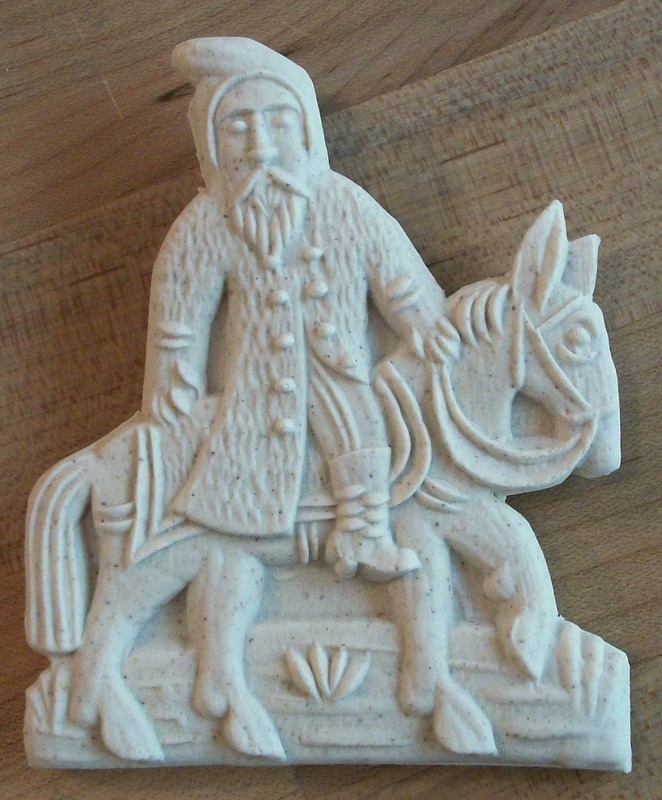 This mold may be used with Springerle, Gingerbread and Spekulatius dough. It would also work well with Marzipan and craft projects such as paper casting. This mold is #1884 and sells for $46.89. Clear and tinted copies of this mold will cost an extra $5.86. Cookie made with mold #1884. #1884 Saint Nicholas with Crozier Mold in Clear. #2014 Junior Saint Nicholas in Touring Car Mold – $43.57. 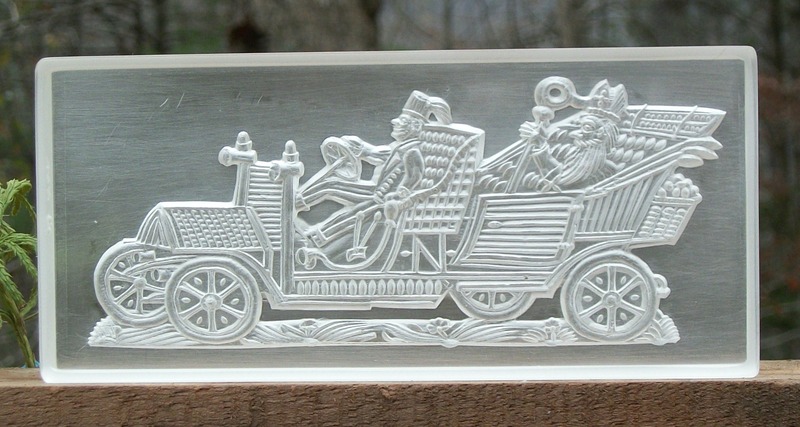 This unique mold measures about 5 7/16″ x 2 1/2″ and features St. Nicholas riding in a luxurious Pierce-Arrow Touring car. In 1909 President Taft made history by ordering two of these cars to be used for official State occasions. Perhaps St. Nicholas is delivering the first of those cars to the White House. 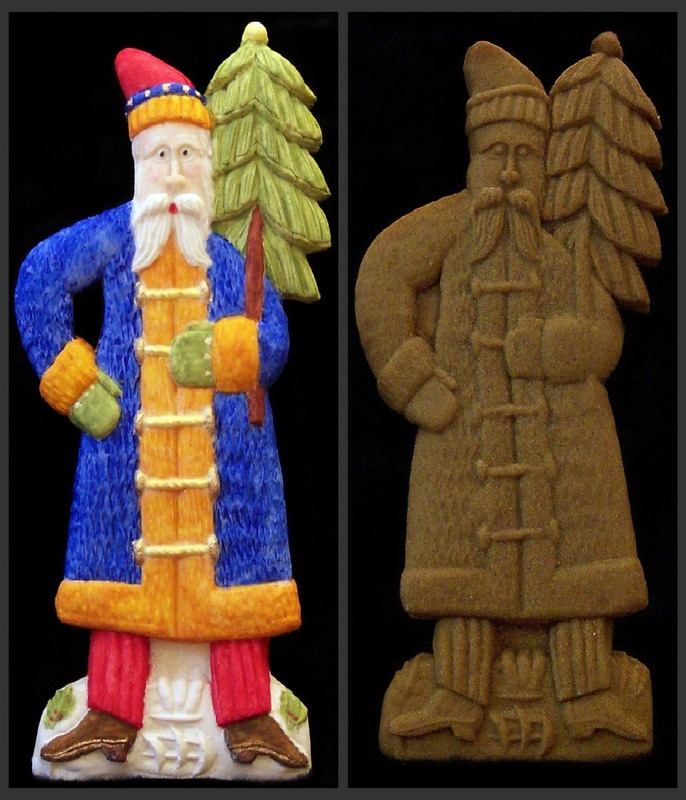 This mold produces a beautifully detailed but small cookie, with the image measuring about 4 3/4″ long and about 2″ at its tallest. Saint Nicholas is driven around in luxury while the “N” on the side of the car identifies the owner as Nicholas. Strapped to the back of the car is a basket of apples. This mold works well with Springerle dough but could be used with Speculaas, Spekulatius and Gingerbread doughs. It could be used with Marzipan as well. This mold has grooves on its sides to assist in lifting it from the dough. This mold is #2014 and sells for $43.57. 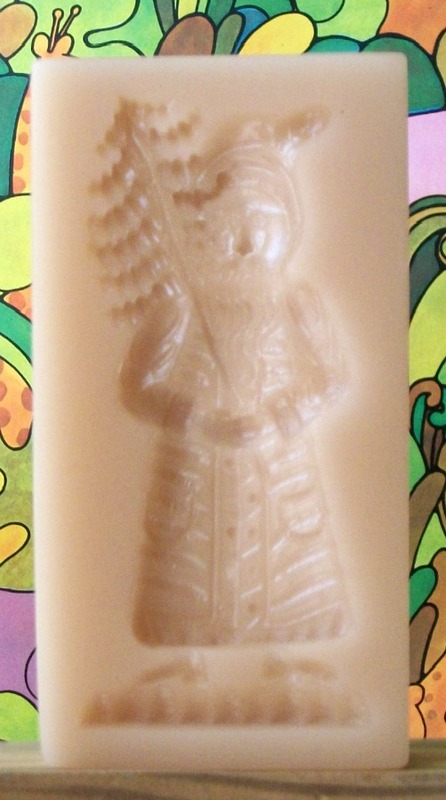 Clear and tinted copies of this mold will cost an extra $5.45. This is the smallest version of this image we offer. #2014 Junior Saint Nicholas in Touring Car Mold. This TSB exclusive mold is limited to 500 copies and measures about 4 3/4″ x 3 11/16 with the image area measuring about 3 7/8″ x 3 5/8″. Inside a beautiful heart shaped border of holly leaf accents, Santa can be seen skiing the slopes to deliver toys and goodies. The scene includes snow laden trees, buildings, a snowman, and a split rail fence. Santa is carrying a basket of fruit on his arm and a bundle of toys on his back. His coat, hat and skis can easily be seen. The rich details are all very detailed and dimensional. Everything about Santa is striking and makes this is a “must have” gift for Santa collectors, cookie artisans and crafters alike. In addition to using this mold to produce beautiful cookies, it can also be used to produce ornaments and greeting cards. This mold has grooves on its sides to assist in lifting it from the dough and is limited to 500 copies. This mold is #2011 and sells for $64.73. Clear copies of the mold are an extra $8.09. Cookie made with mold #2011. #2011 2017 TSB Santa Mold in Clear, Cranberry, Sharon Rose, Blue, and Green. #1772 2015 TSB Santa Mold – $44.18. 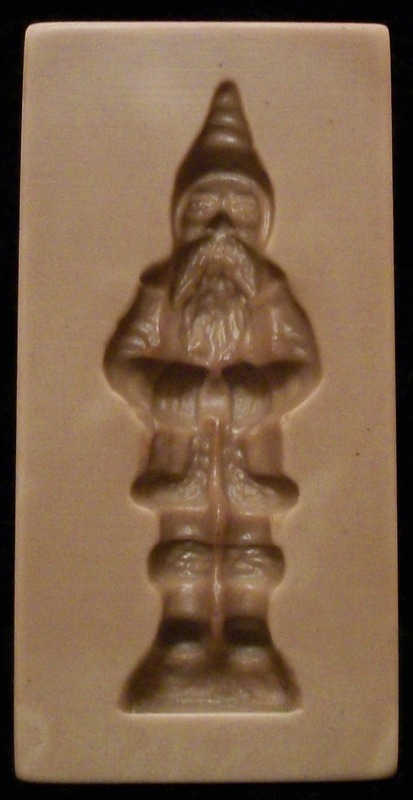 This mold measures about 4 1/8” x 3 1/4″ and shows Santa taking a pause in his work to enjoy his pipe. Nicely detailed with overall good depth and dimension. Santa is holding his book with the names of all the good boys and girls he needs to visit. At his feet are his toy sack (brimming with all sorts of toys) and a fine handcrafted rocking horse. You will also see snowflakes falling around Santa. The image has a simple oval ring border which gives the scene an overall picturesque look. 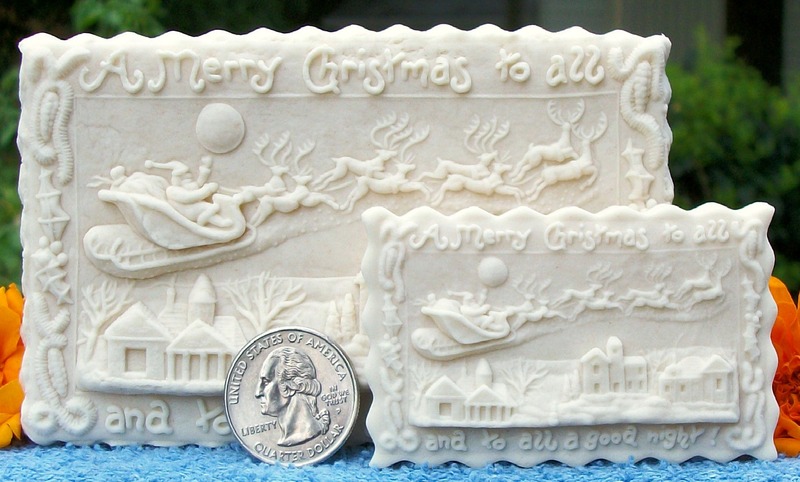 In addition to using this mold to produce beautiful cookies, it can also be used to produce ornaments and greeting cards. This mold is limited to 300 copies. This mold is #1772 and sells for $44.18. Clear copies of the mold are an extra $4.80. This mold also comes in a smaller size (#495). Cookie made with mold #1772. #1772 2015 TSB Santa Mold in Clear. 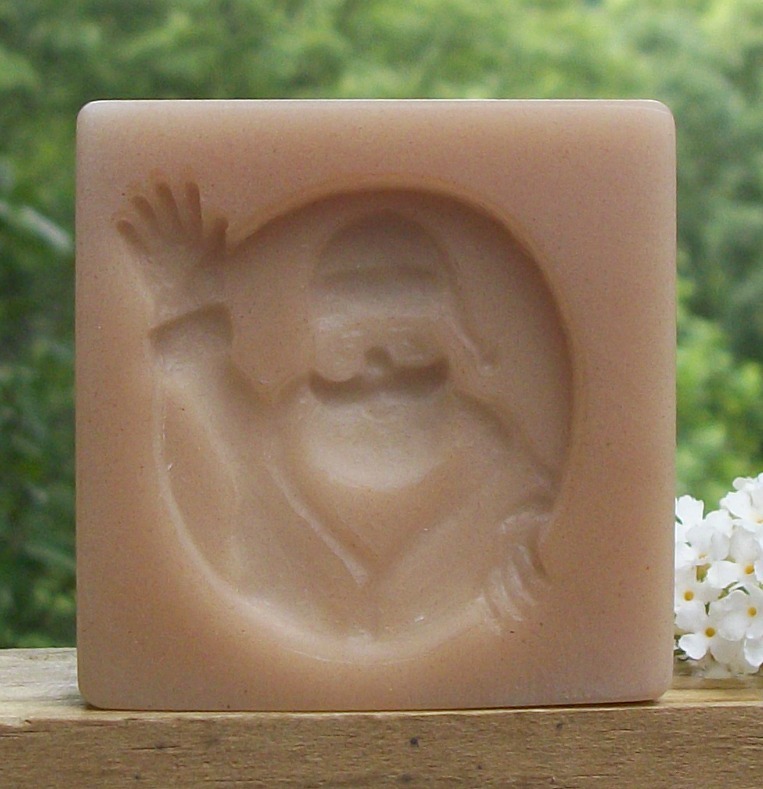 This is a deep and beautifully detailed mold of Santa. This is a versatile mold that works well for cookies, Marzipan and other sweet confections. It would also produce beautiful ornaments. This mold measures about. Tip: The mold produces a Santa with a smooth hat but by using a toothpick or similar item, you can dress it up to look textured. Even the ball on the hat can be made to look fluffy. This mold measures about 3 1/8” x 2 5/8”. While pressing cookies with this mold my thoughts went to making confections with this mold. What a hit the trimmed Santa would be. You can use round cutters which make a very nice cookie or trim the Santa out for an impressive look. This mold is #71 and sells for $31.50. 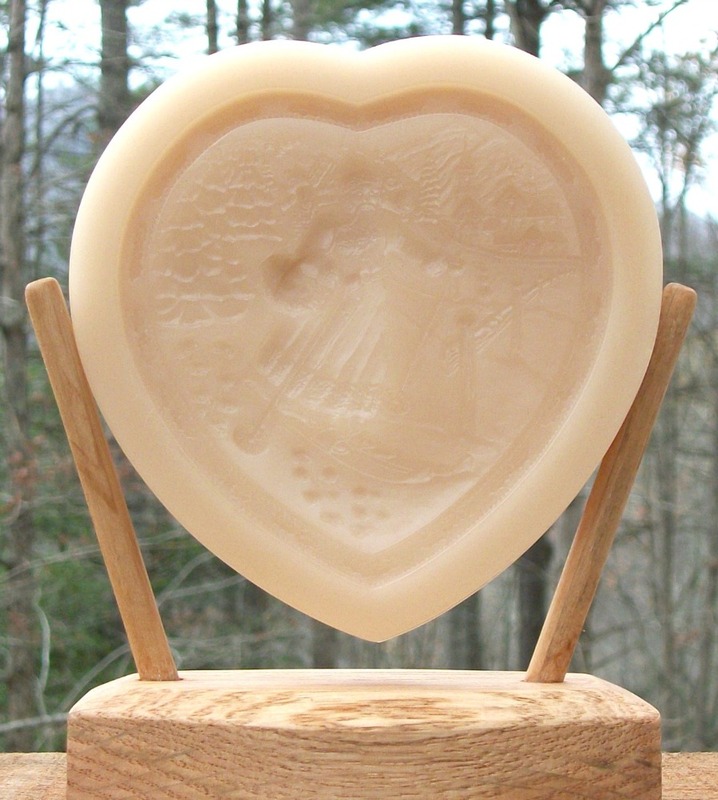 A clear or color tinted copy of this mold will cost an extra $3.94. This mold measures about 2” x 1 1/2” and produces a very nicely detailed deep and dimensional Santa cookie in full beard and moustache. This cookie would stand out nicely on holiday cookie or dessert trays. It has a very nice deep border that gives it a perfect picture frame appearance. 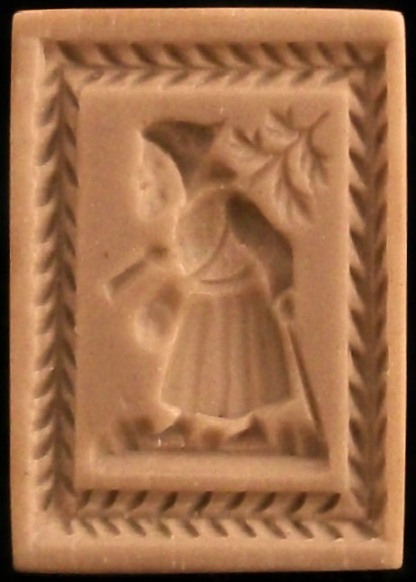 In addition to Springerle this mold also works well with Gingerbread and Marzipan. It is also a good size for crafts, such as ornaments. This mold is item #1611 and sells for $22.95. Clear copies are $1.25 extra. Cookies made with mold #1611. 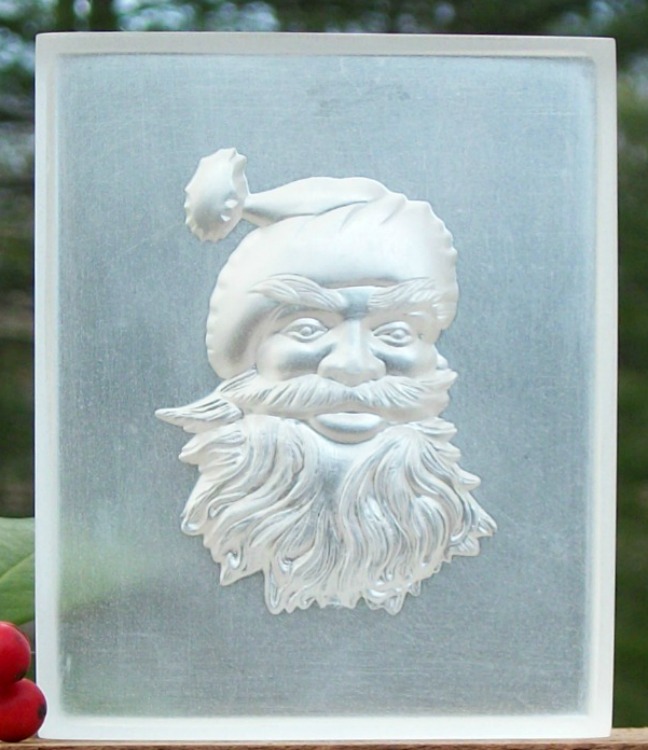 #1611 Umhofer Santa Mold in Clear. 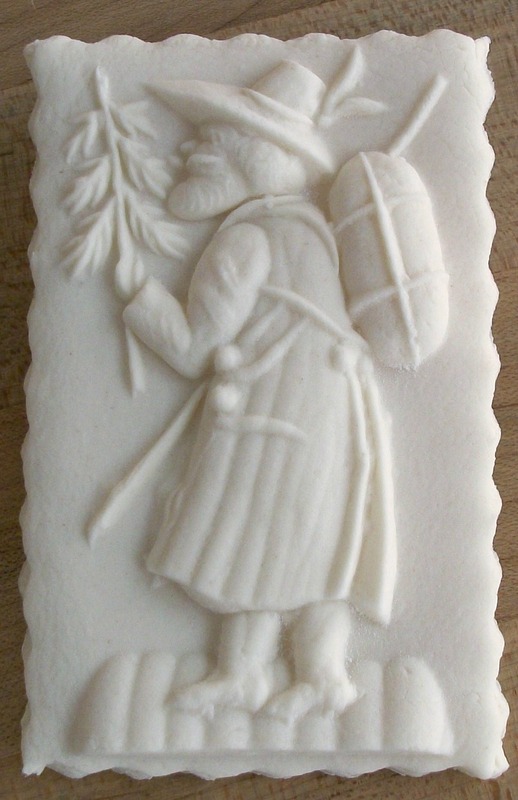 This mold measures about 3″ in diameter and features Saint Nicholas loading up the packs on his donkey for delivery. This is a very detailed scene and the depth is great. You can see the fruits and nuts as well as other goods that are being packed. Saint Nicholas and the donkey are both very detailed and the whole scene has a beautiful border encircling it. This mold will produce a very nice sized “Picture” cookie. This mold has a groove around the side to assist in lifting the mold after pressing. This mold could also be used to produce an attractive cupcake topper. This mold is #1858 and sells for $35.97. 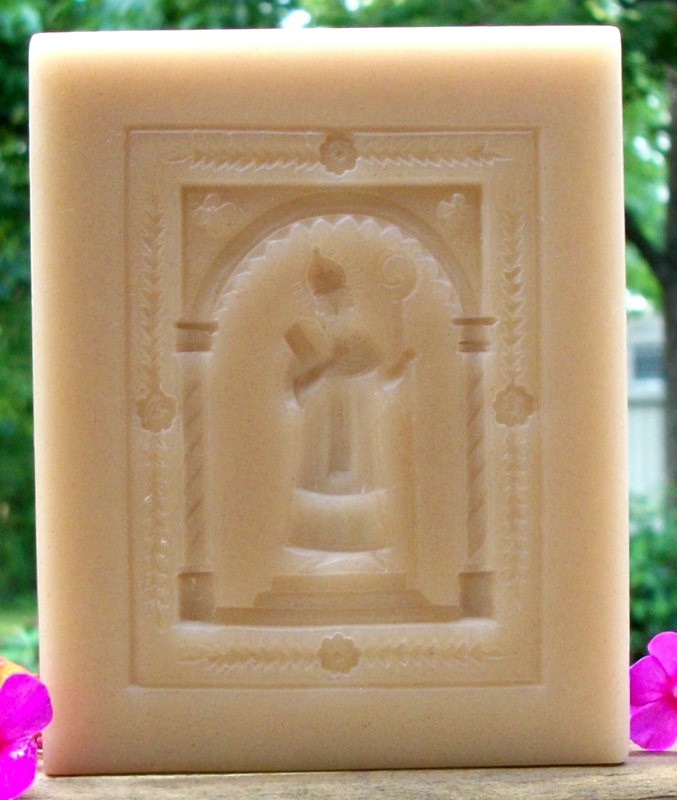 This mold is available in clear and tinted colors for an extra $5.00. #1858 Saint Nicholas Packing in Clear, Cranberry, Sharon Rose, and Green.